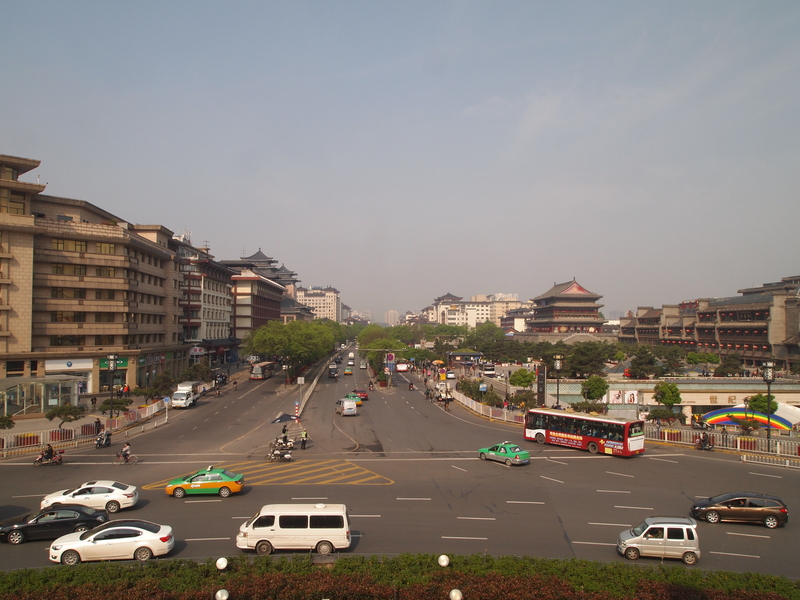 Monday, April 20: Finally, on my last day in Xi’an, I wake up to sunshine. 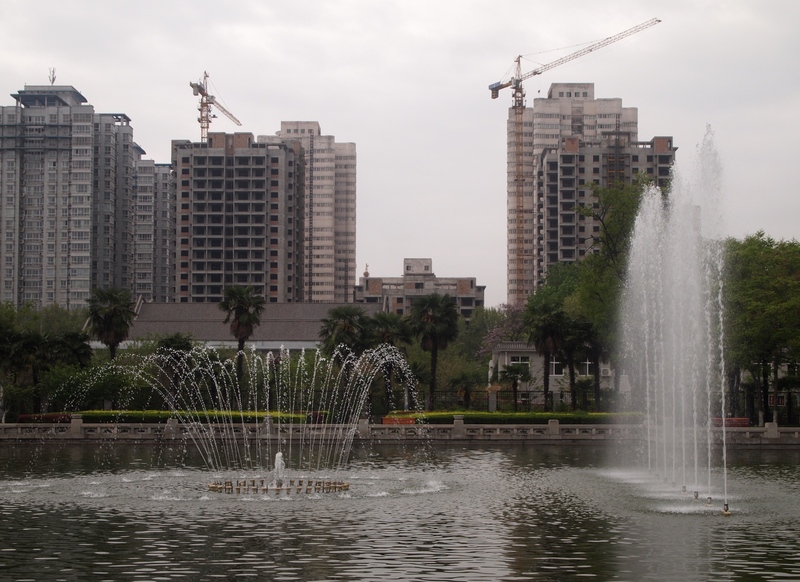 I’m glad because I have a lot I want to see today before flying back to Nanning tomorrow morning. I enjoy the buffet breakfast in the hotel, then I head out toward the Muslim Quarter. 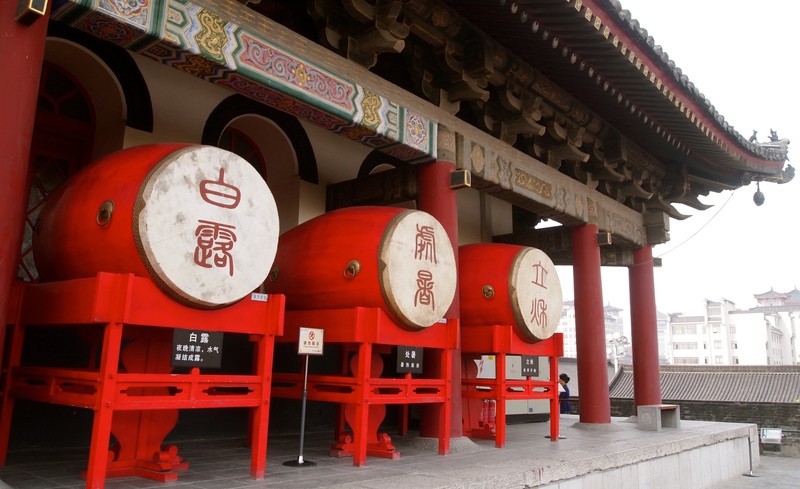 I make stops at the Bell Tower and the Drum Tower on my way there. 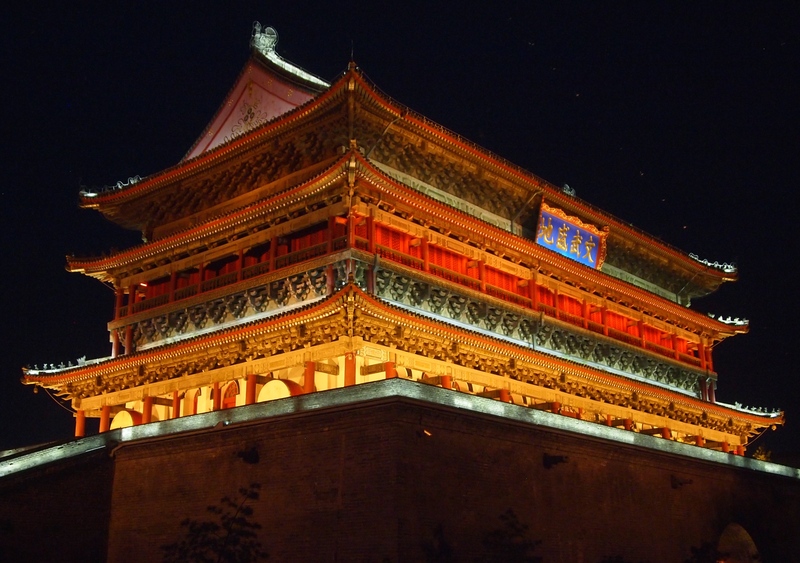 The Bell Tower was built in the 17th year of Hongwu (1384 AD) of the Ming dynasty. 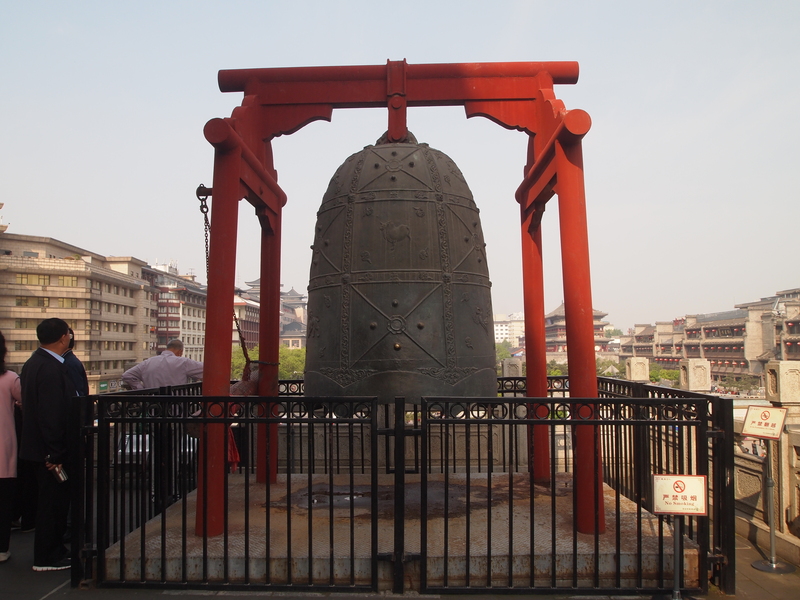 It’s named for a huge bell hung in the tower to tell the time. 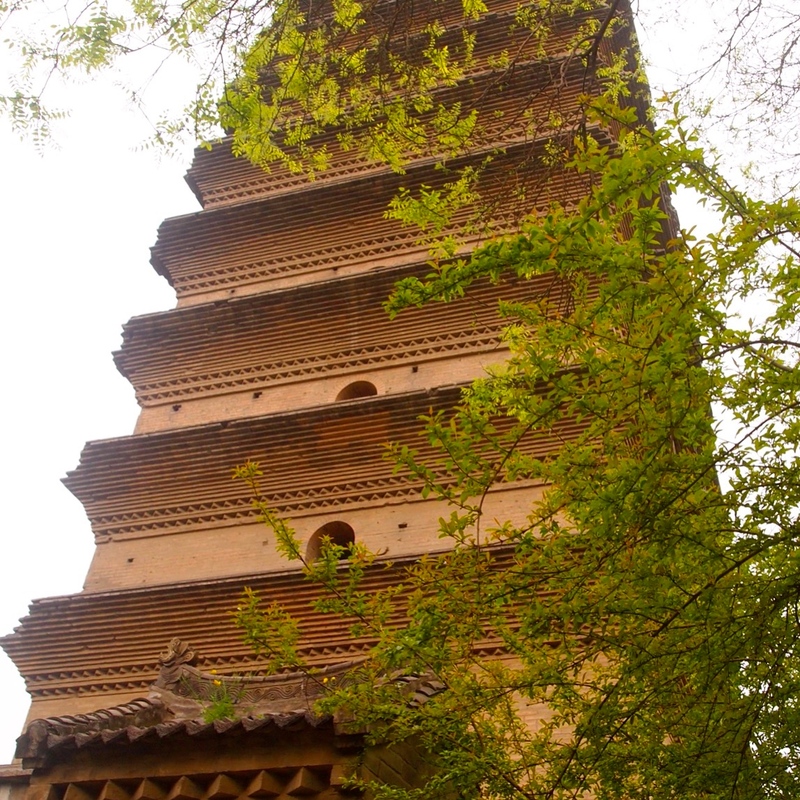 The tower is a mixed structure of bricks and wood, is 1370 square meters, and is 36 meters high with the architectural style of the Ming dynasty. 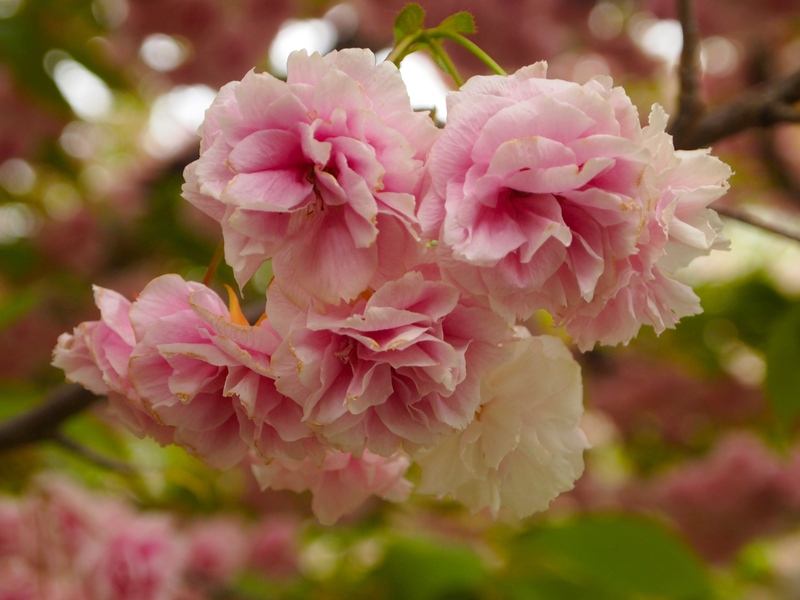 It has undergone many repairs since 1949. 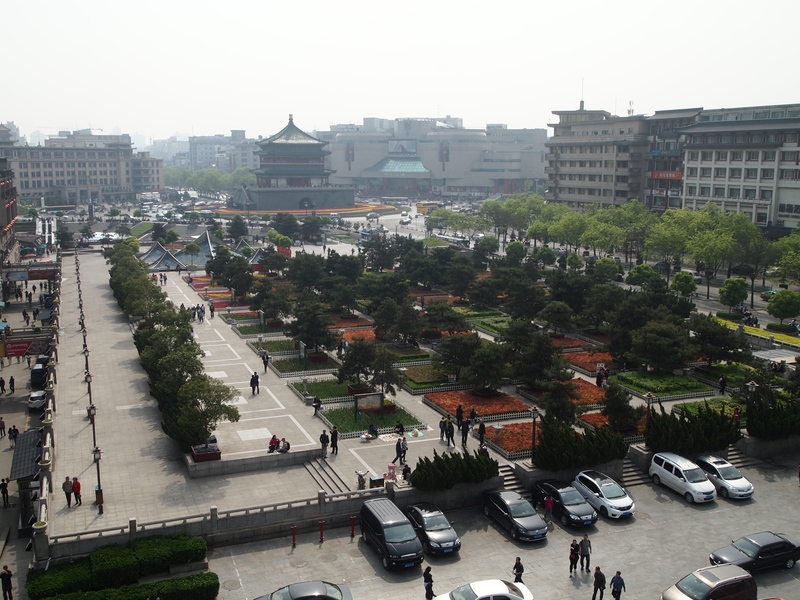 I walk around the perimeter of the tower, which sits in the middle of a roundabout, and see views in all directions. 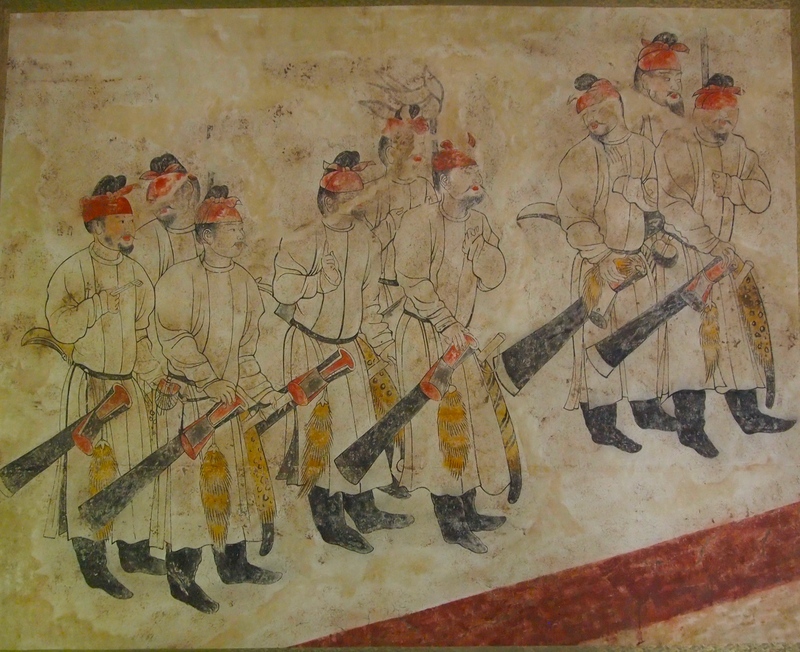 This is the view to the north. 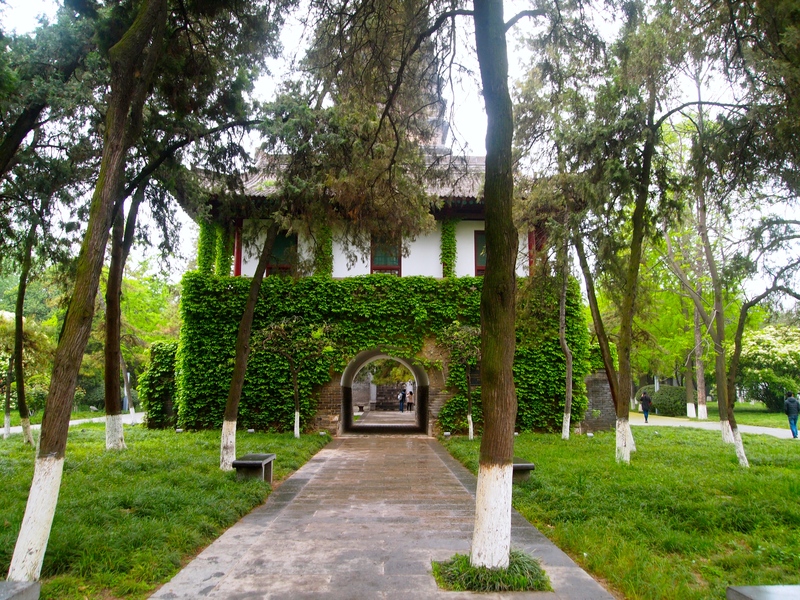 I can see the Drum Tower to the northwest. 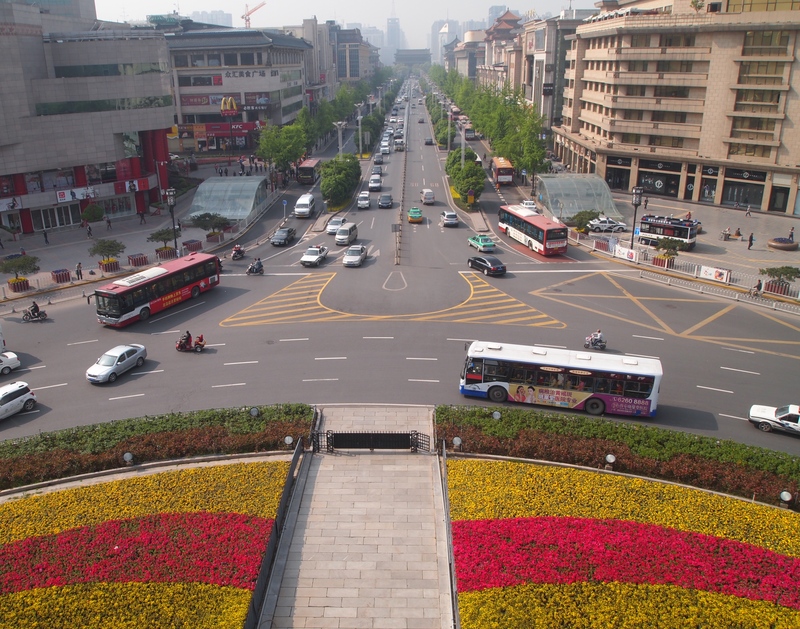 Looking directly west I can see the busy streets of Xi’an and the Drum Tower to the right. 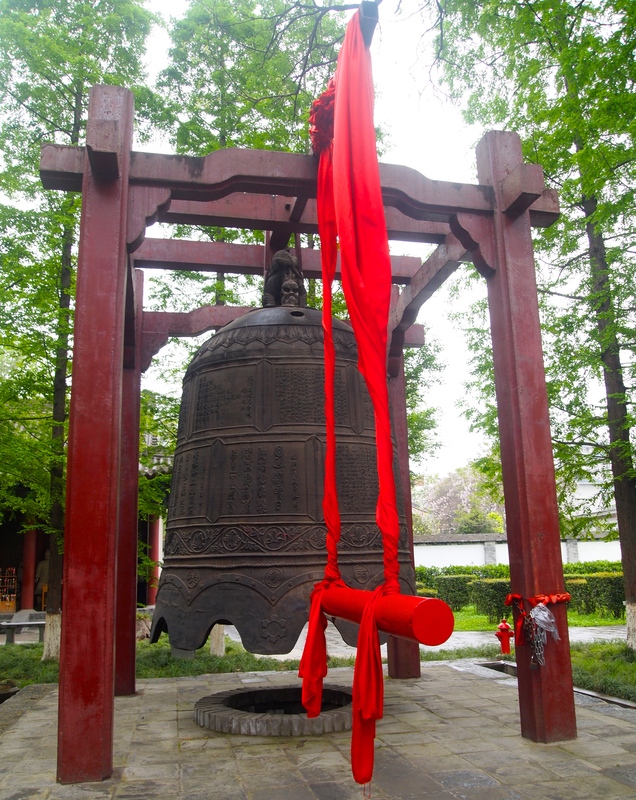 The Imitated Qin Chime Bells, 39 pieces altogether, are reproduced in line with the Yuefu bells unearthed from the mausoleum of the first emperor of the Qin dynasty and the Bianbo bells excavated in Meixian and Fufeng counties of Shaanxi province. 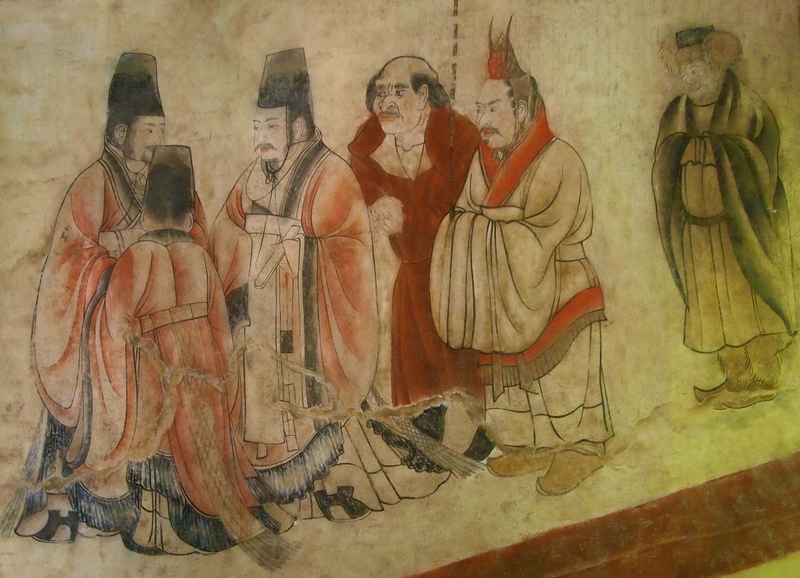 In the Chime Bell room are some interesting Chinese paintings. 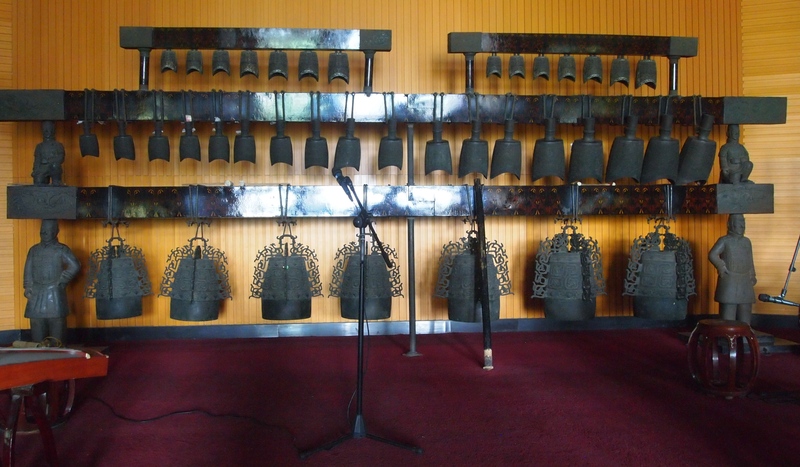 According to a placard in the room, this set of imitated chime bells includes 7 bo bells, 18 Yong bells, and 14 Niu bells. 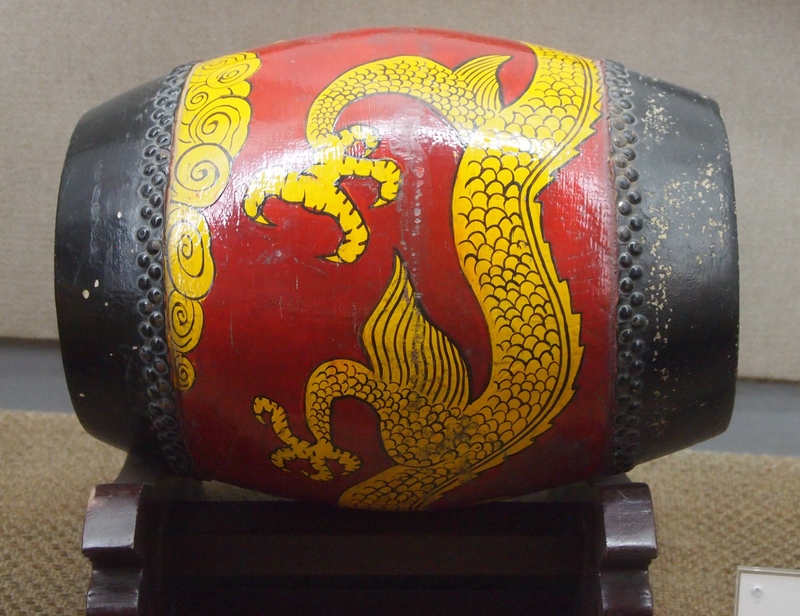 They are exquisite in decorative patterns and are in timbre. 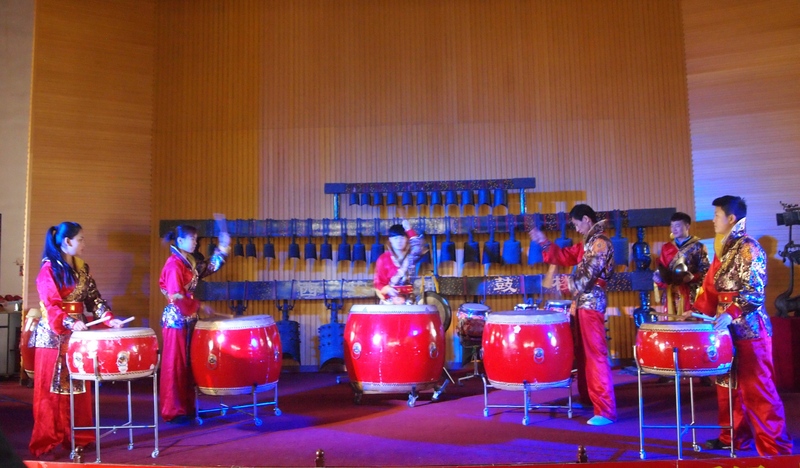 Such classical musical instruments could produce tunes of all kinds, ancient and modern, Chinese and foreign. 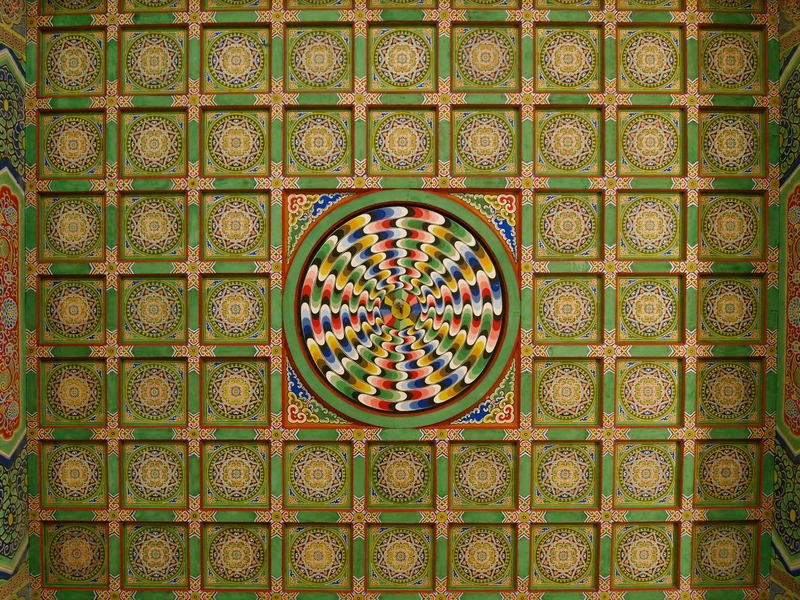 I adore the colorful painted ceilings in this room. 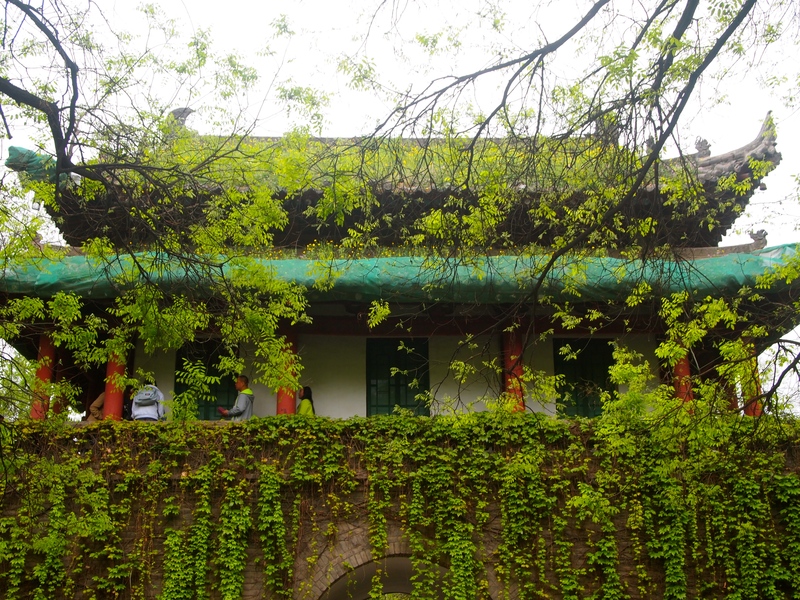 Outside, I admire the iconic flying eaves that are so perfectly Chinese. I see the view looking south to the south gate of the city walls. My hotel is along this stretch, only a block or two from the tower. 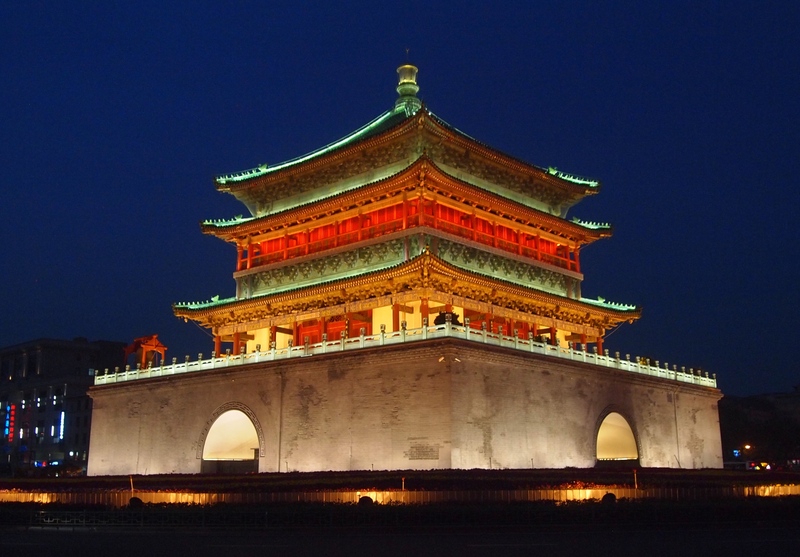 It’s the perfect location for exploring Xi’an. 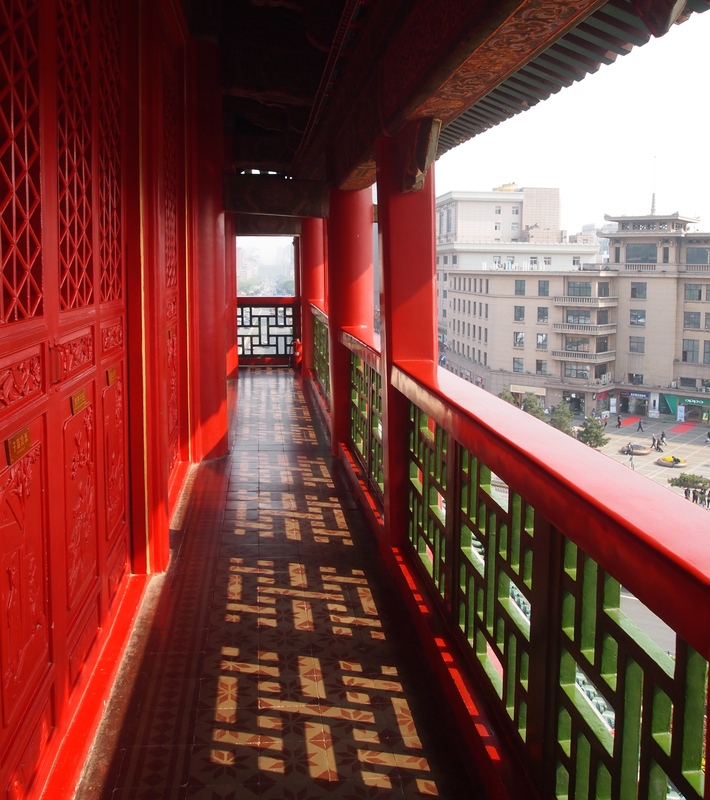 I love the red doors and the carvings on the railings that make interesting shadows on the walkway. 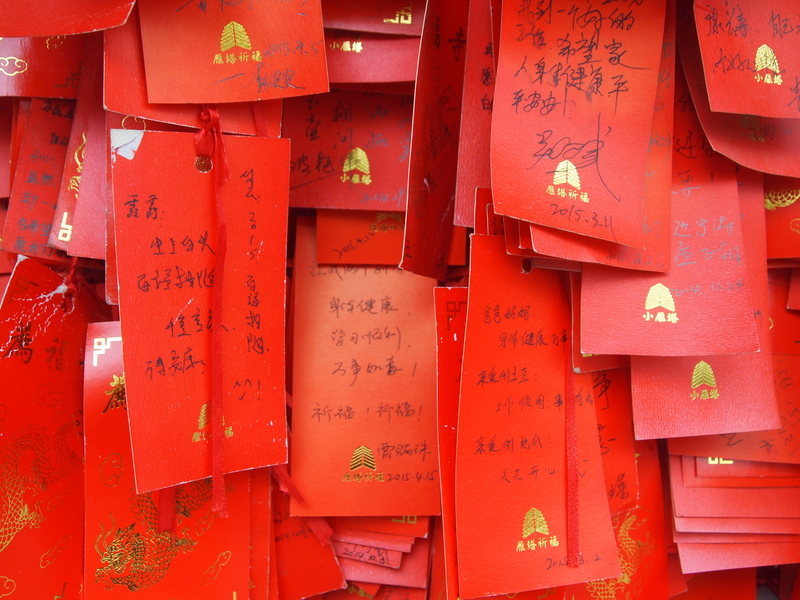 I come full circle and see the western view again. 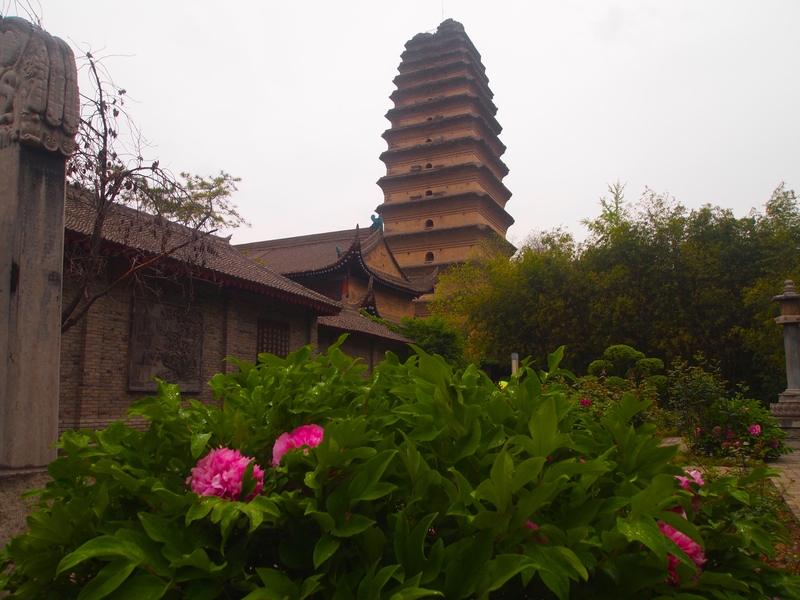 After leaving the Bell Tower, I walk west to the Drum Tower, built in the 13th year of Hongwu (1380 AD) of the Ming dynasty. 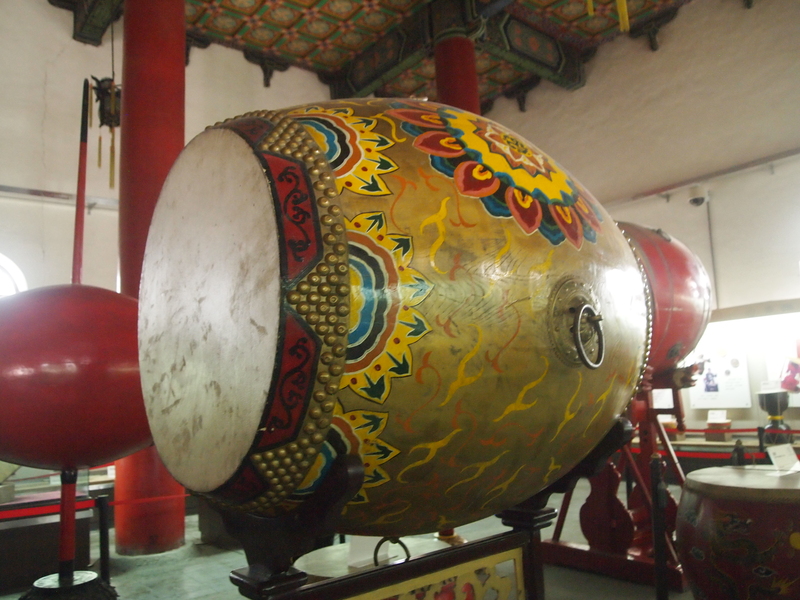 It’s named for the huge drums laid in the tower to tell the time. 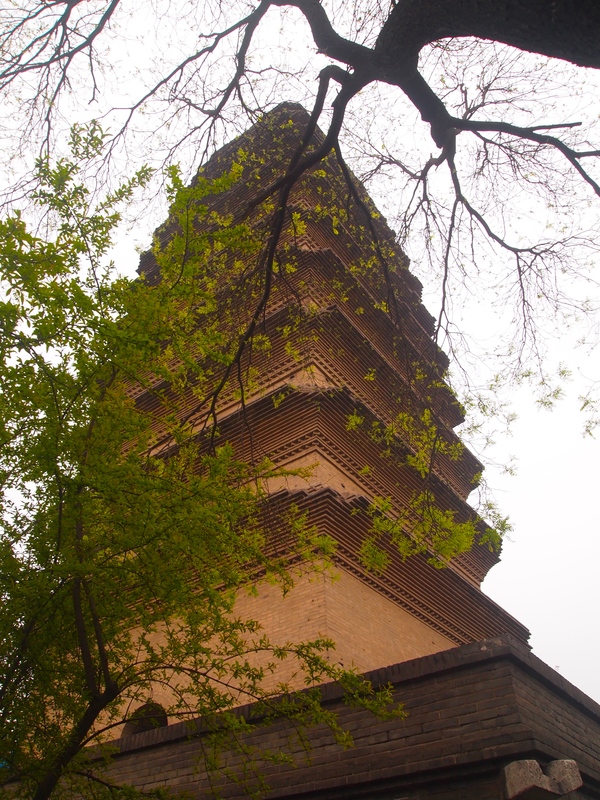 The tower is also a mixed structure of bricks and wood, occupies an area of 1840 square meters, and is 34 meters high in the typical architecture of the Ming dynasty. 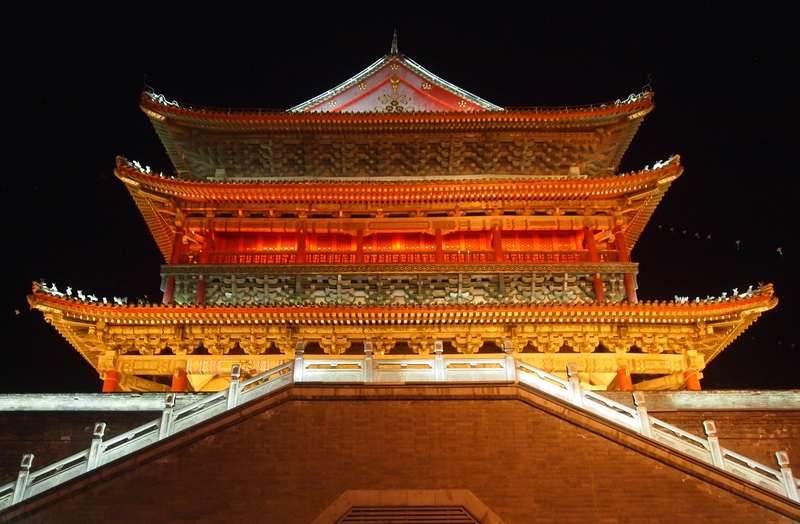 Like the Bell Tower, it has undergone many repairs since 1949. 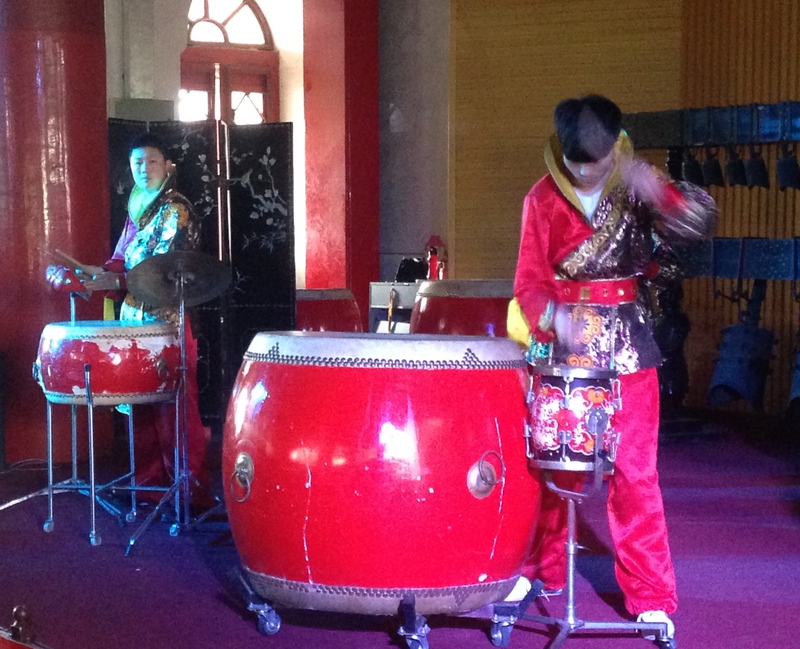 It just so happens that I arrive at the Drum Tower just in time to hear the drum performance. 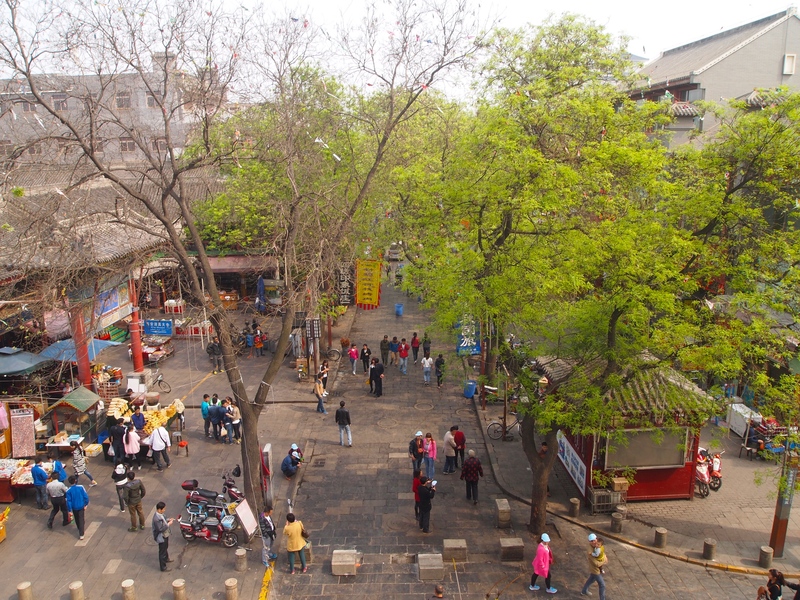 Walking around the back rim of the Drum Tower, I can see Beiyuanmen in the Muslim Quarter. It doesn’t look quite as busy as it was last night. 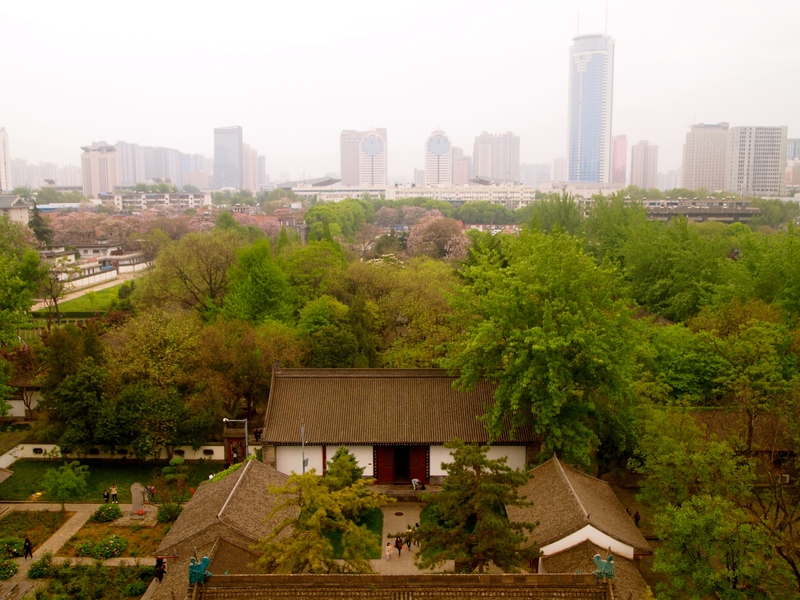 From the Drum Tower, I can see some gardens and the Bell Tower to the east. 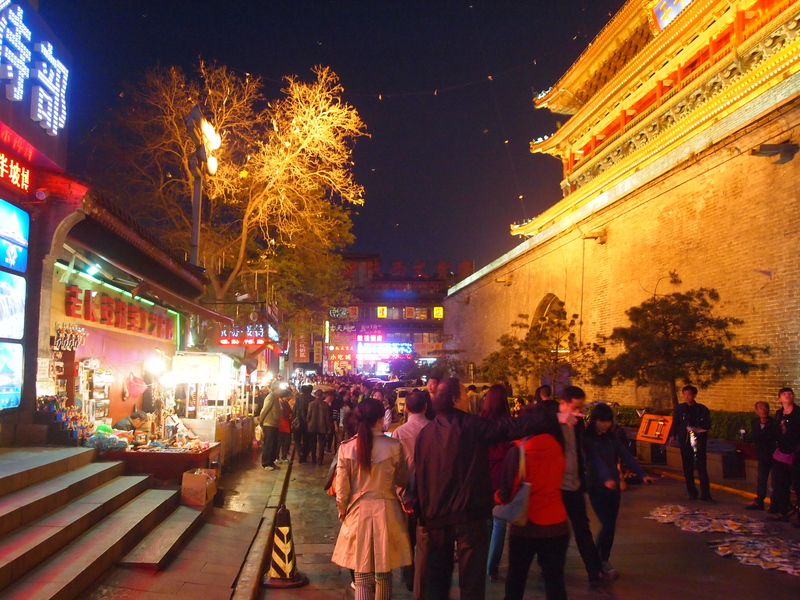 Around the north side of the Drum Tower, there is the usual bustling commerce that’s ubiquitous throughout China. 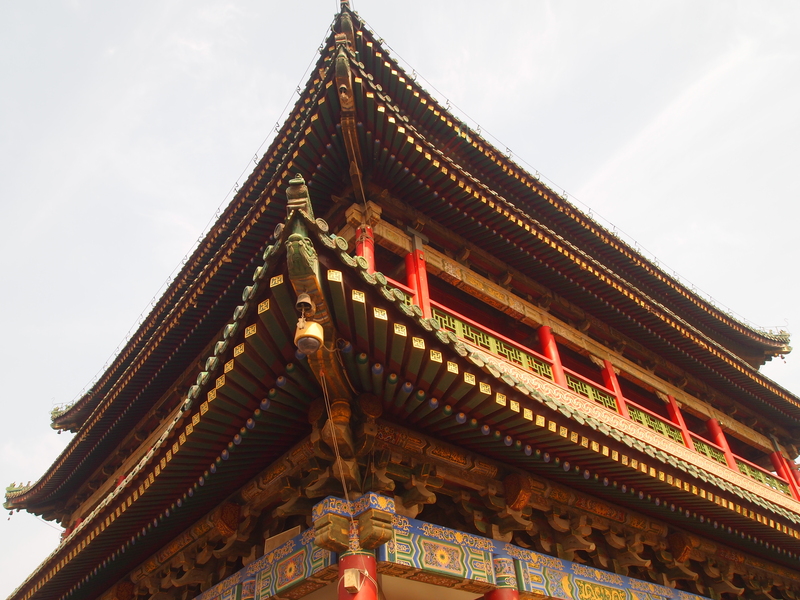 After leaving the Drum Tower, I head down and out to explore the Muslim Quarter and the Great Mosque. 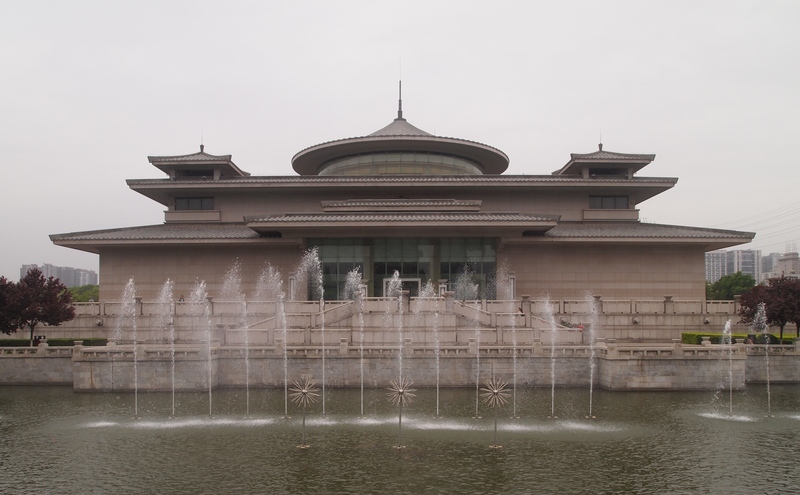 Sunday, April 19: After my full day with the Terra Cotta Warriors, the emperor and his concubine, and Chiang Kai-Shek, Chelsea drops Andrew and me back at our respective hotels. 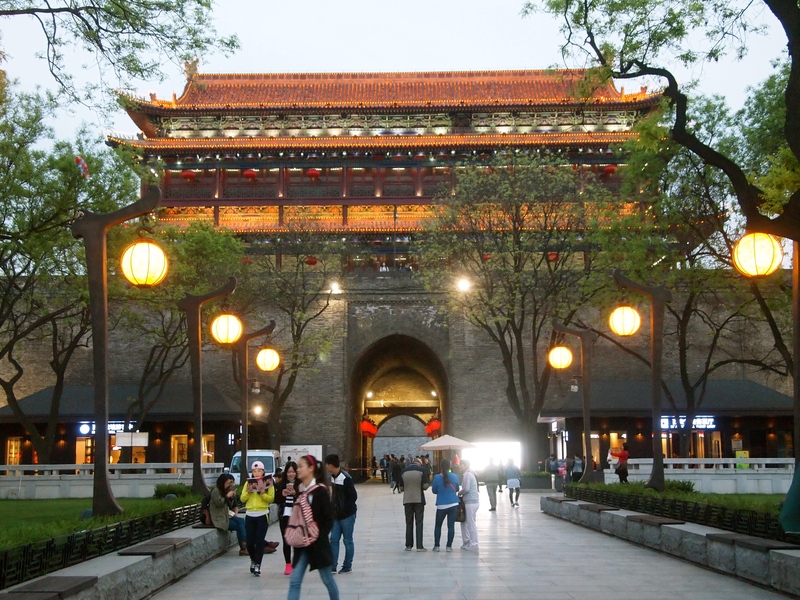 I sit in the lobby for a while checking emails and posting some pictures before heading out to check out a restaurant recommended by Chelsea; it sits on the street between the Bell Tower and the south gate of the city walls. I find when I go inside the restaurant that it’s outrageously expensive, so I decide to leave and head to the Muslim Quarter, which I’ve heard is lively and has some of the best food in the city. 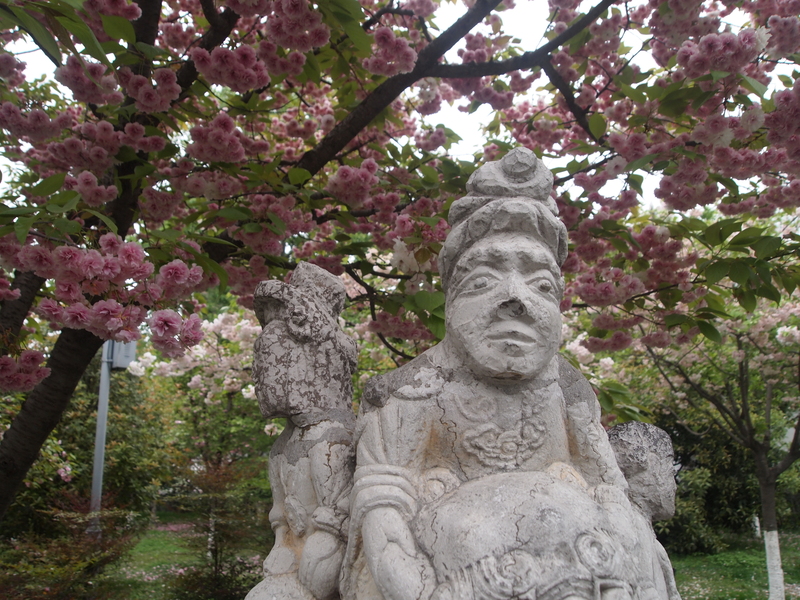 I haven’t yet explored the ancient city walls, but I hope to do so tomorrow. I’ve heard you can rent a bicycle at the top of the wall and can ride all the way around the perimeter if you like. I can only hope there’s no rain. 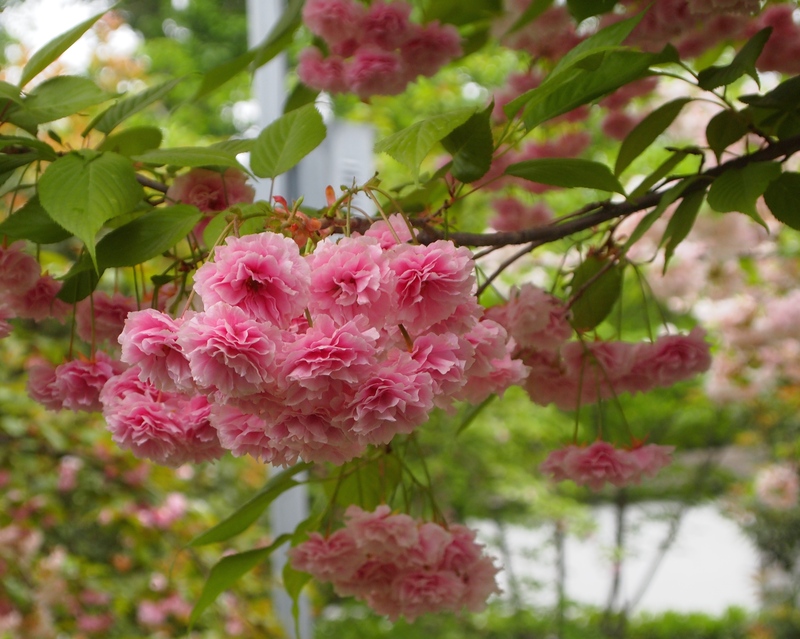 As I walk north on the main street, I can see the fabulous Bell Tower glowing in its golds, greens and reds. 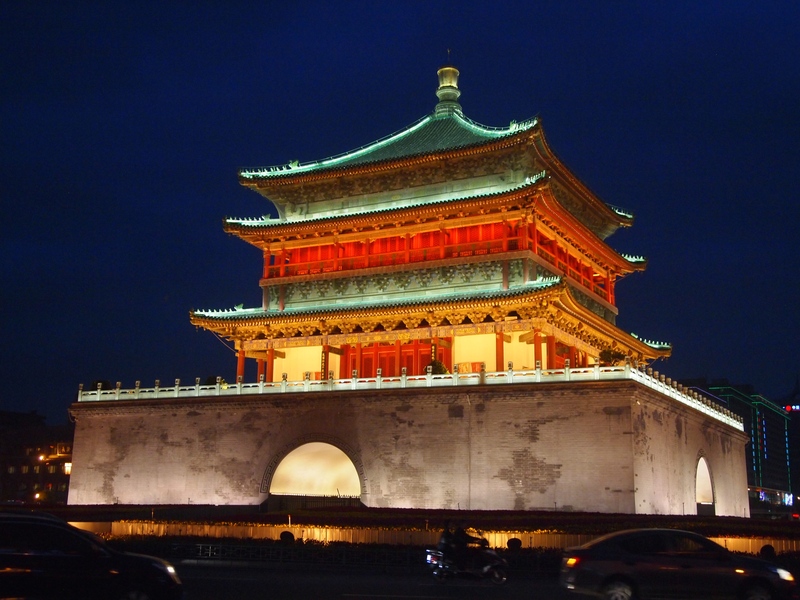 At the Bell Tower, I turn to the west and stroll toward the Drum Tower. It is also lit up beautifully. 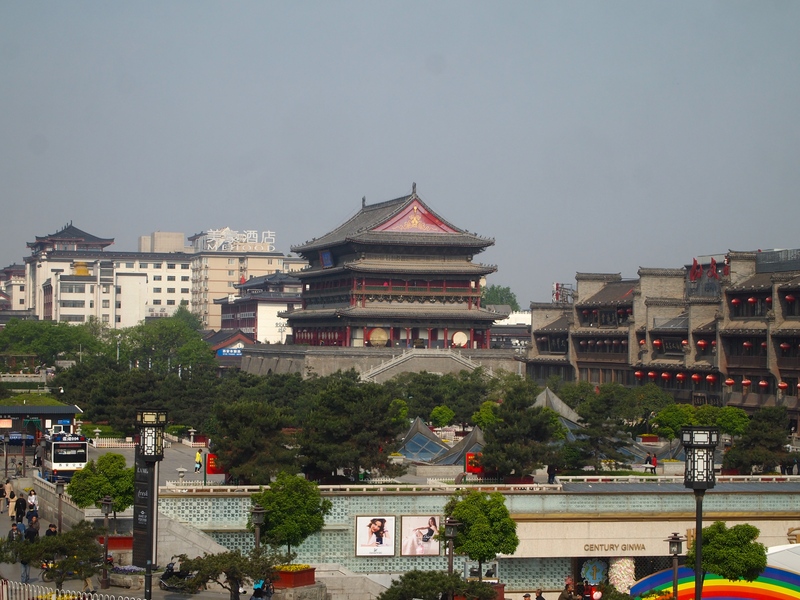 Just north of the Drum Tower is the Muslim Quarter, home for centuries to Xi’an’s thirty thousand Hui people, said to be descended from 8th century Arab soldiers (Lonely Planet China). 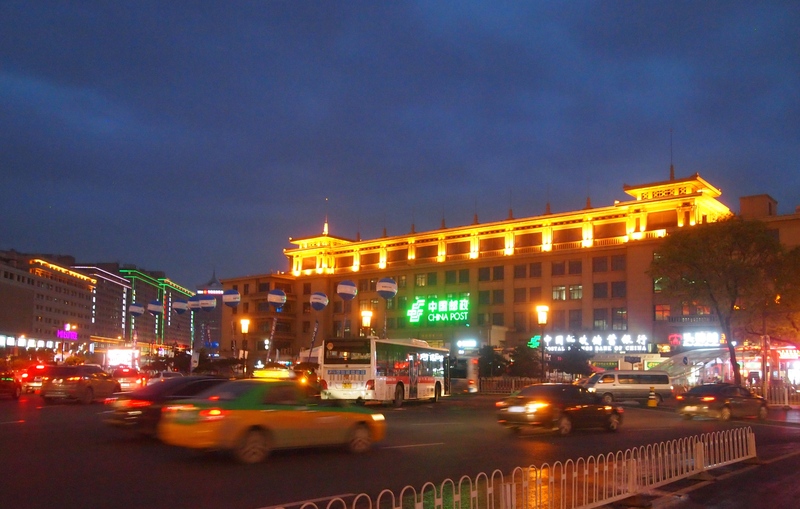 The quarter covers several blocks inhabited by over 20,000 Muslims. 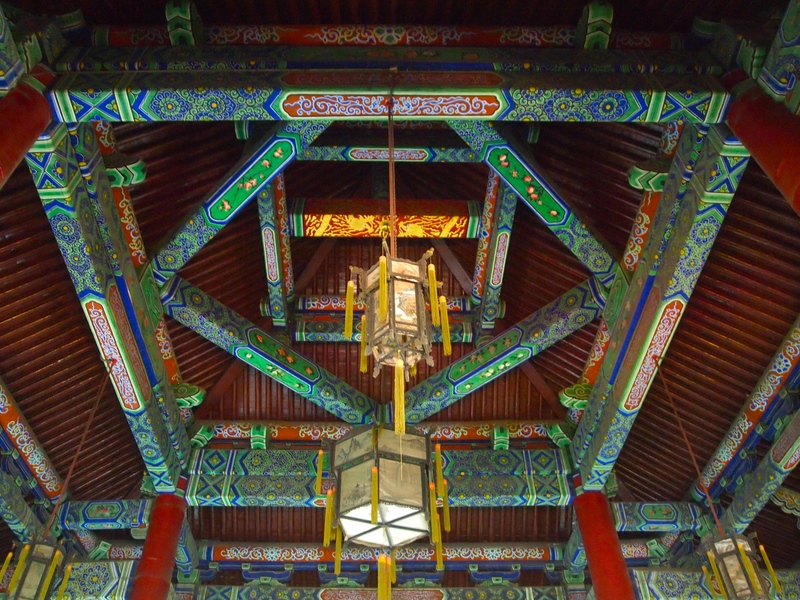 There are about ten mosques in this area, among which the Great Mosque is the most famous and popular (China Travel Guide: Muslim Quarter). 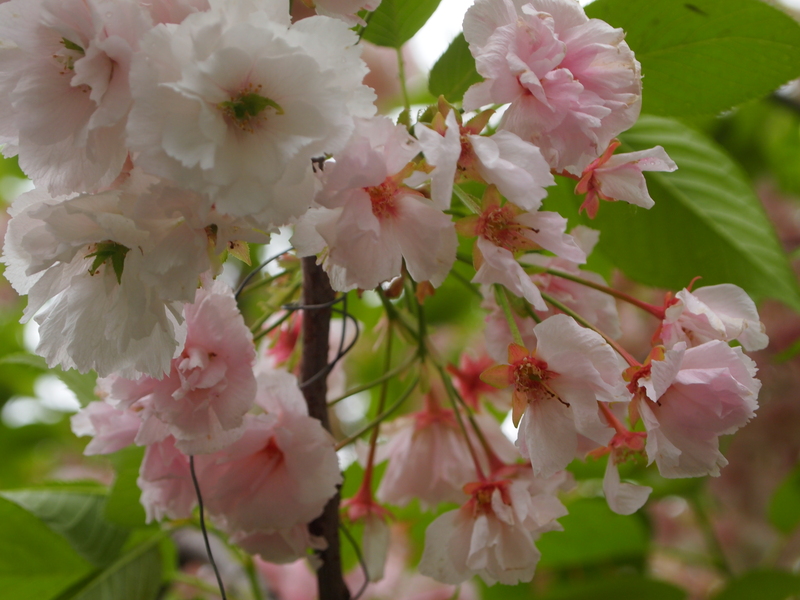 I plan to visit the area in greater depth tomorrow. 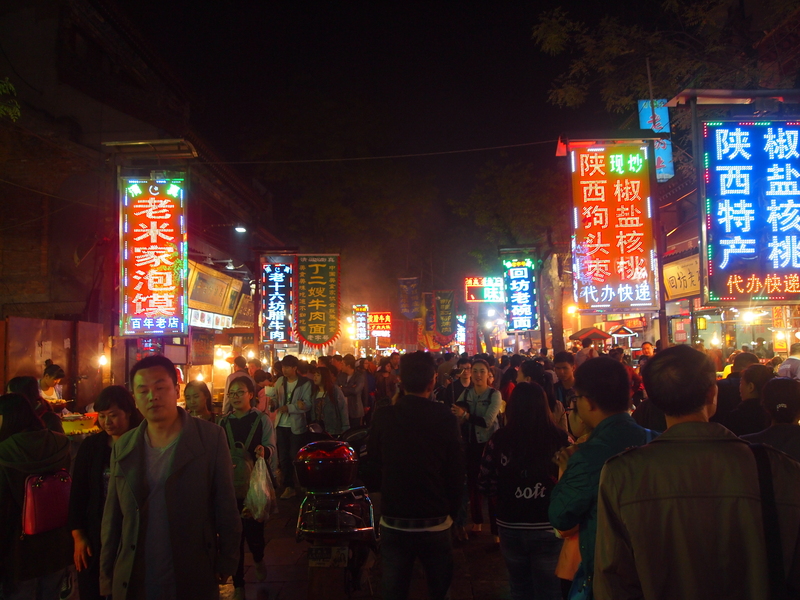 Muslim food and souvenir vendors abound on Beiyuanmen, the flagstoned narrow street just north of the Drum Tower. 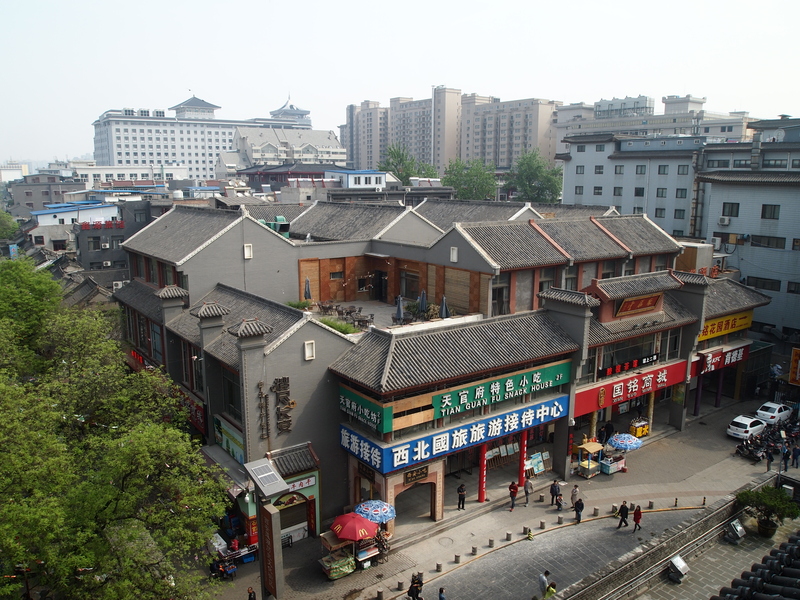 The buildings on both sides of the street are modeled on architectural styles of both the Ming (1368-1644) and the Qing Dynasties (1644-1911). 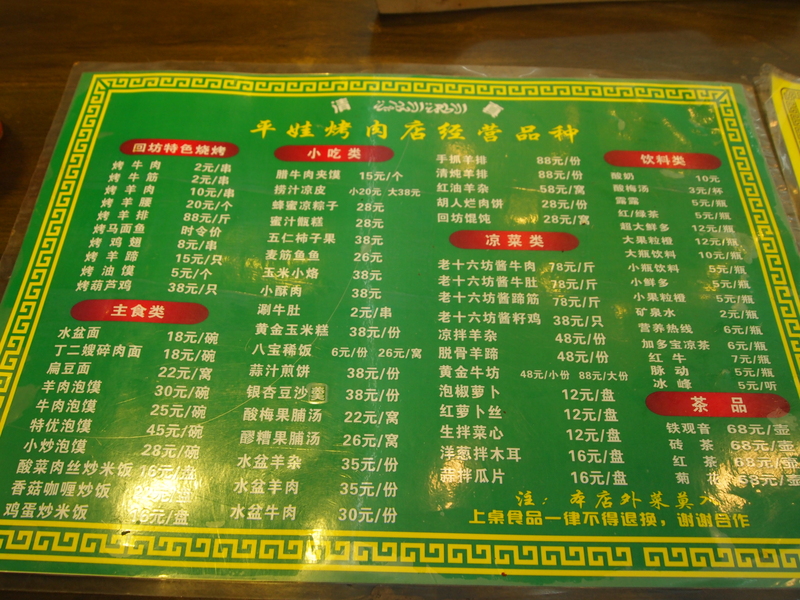 The owners are all Muslims (China Travel Guide: Muslim Quarter). 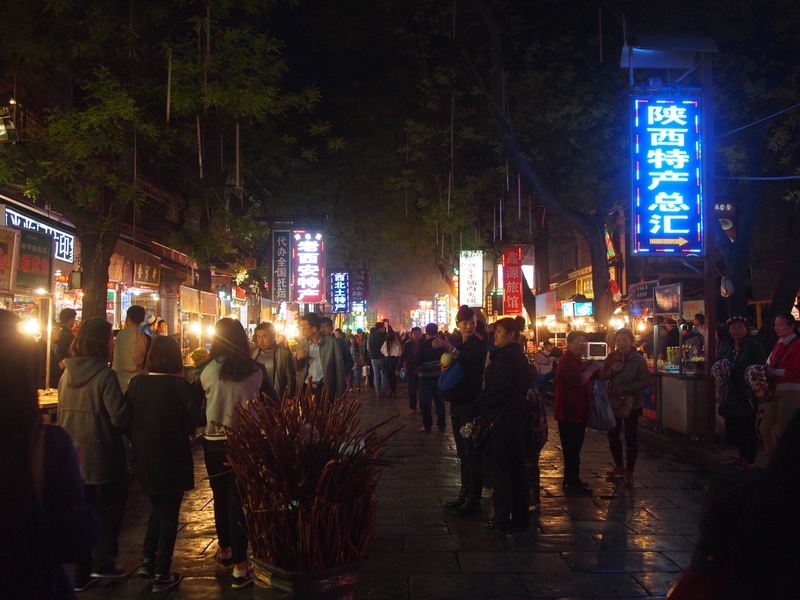 The Muslims on Beiyuanmen are devout followers of Islam, so they form a tight-knit community, which maintains its own culture and traditions to this day (China Travel Guide: Muslim Quarter). 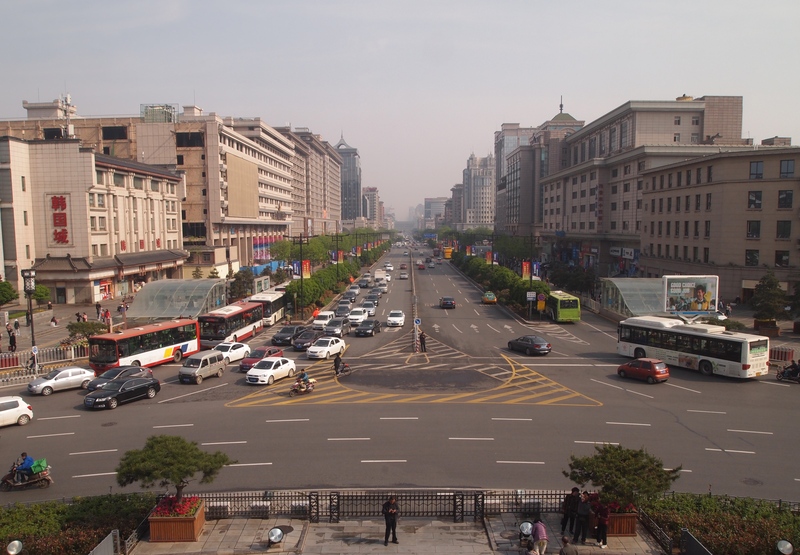 As you can see below, the street is very crowded this evening. I stop in a restaurant for some dinner. I’ve heard of a delicious soup with beef or lamb that’s poured over unleavened bread, but I have a hard time finding it on the menu, even using my cumbersome WayGo app. I finally settle on some very wide spicy noodles that I see at someone else’s table. I gesture to the waitress that I’d like whatever the man in the center table is having. 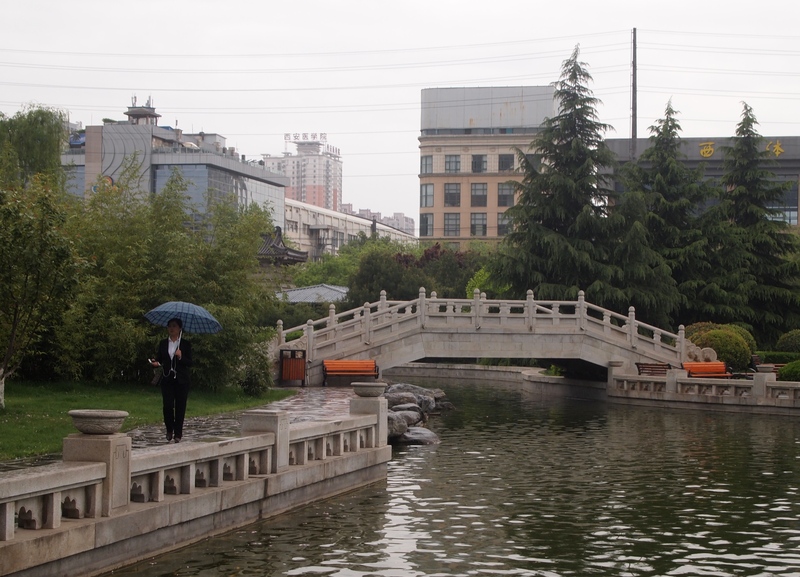 I didn’t mention that I’ve had an upset stomach most of the day and, even tonight, my stomach is feeling a little queasy; these stomach problems have accompanied me throughout China over the last year. 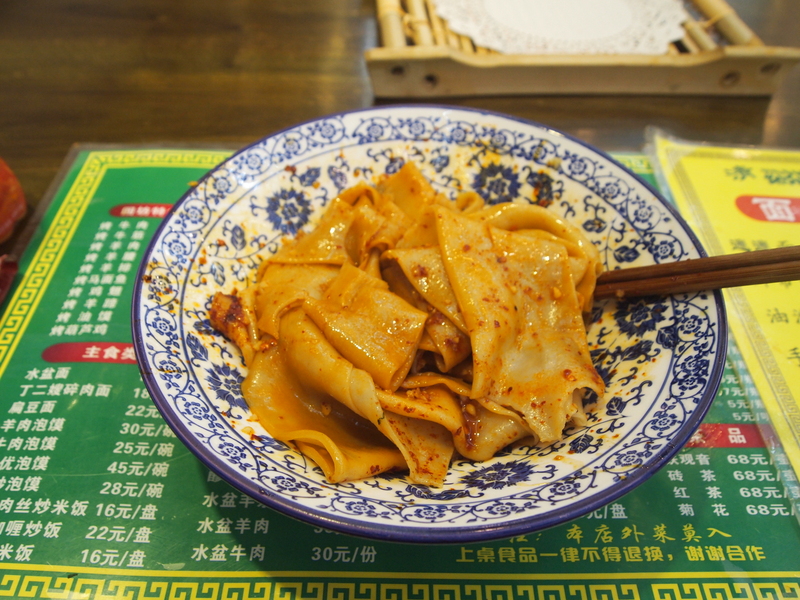 That doesn’t stop me from eating every last bite of these oily and spicy noodles, which are fabulous. 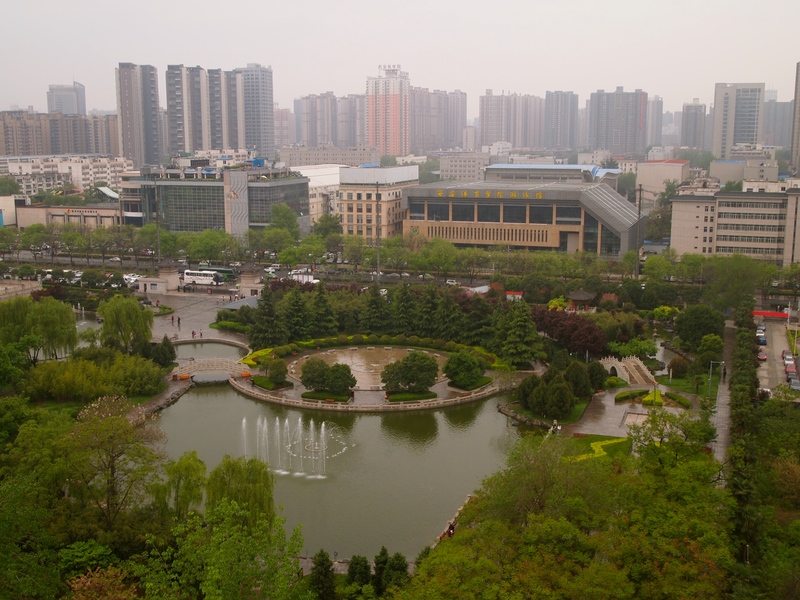 Saturday, April 18: Following my long day of exploring a rainy Xi’an and having a rest in my room at Fortune Suites, I head out to look for something to eat. My stomach has been seriously messed up ever since I ate the Indian food this afternoon, so I don’t dare venture far. 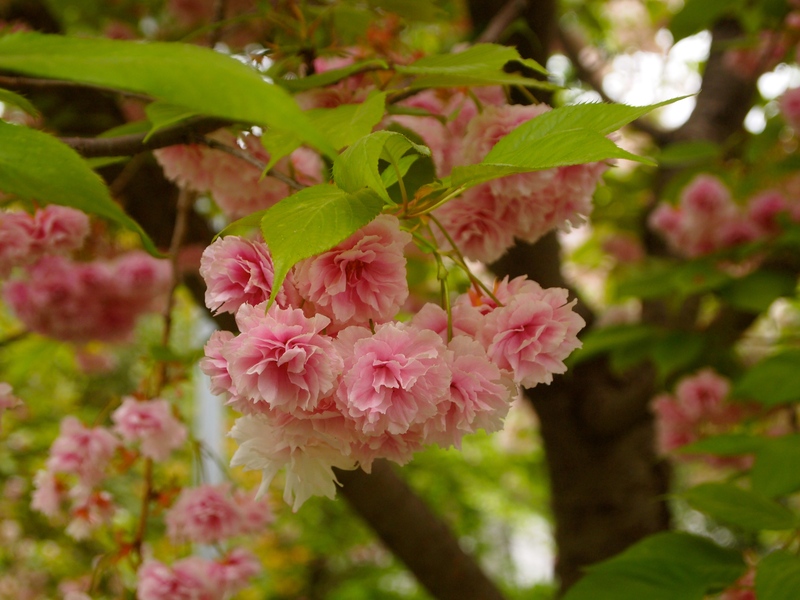 I’m still hungry even though I don’t feel good, and I’m hoping whatever I can find will sit well with me. 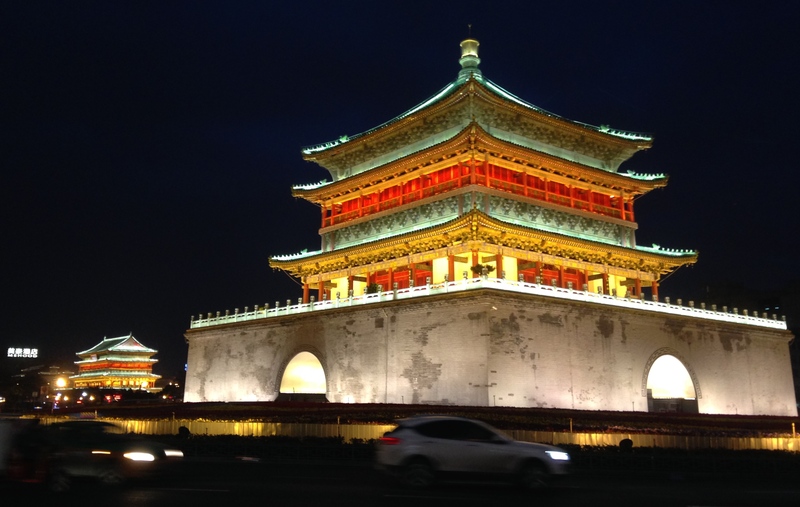 My hotel is luckily right in the heart of the old city, marked by the Bell Tower, which sits at the crossroads of the four major streets of the city. 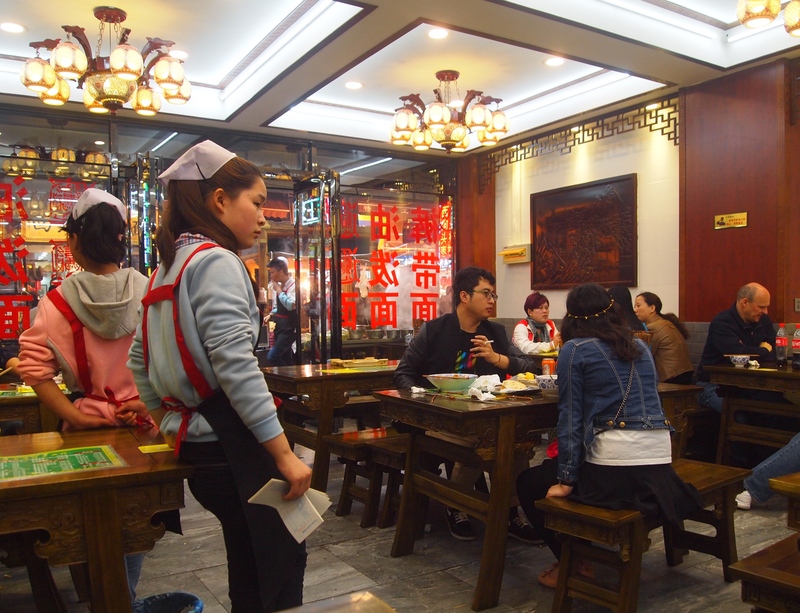 Luckily, in the area surrounding the Bell Tower are a number of Western restaurants. I see a Pizza Hut, which is surprisingly popular in China, so I head there for my favorite fried shrimp meal, which is really just an appetizer portion. I think that will take care of me tonight. 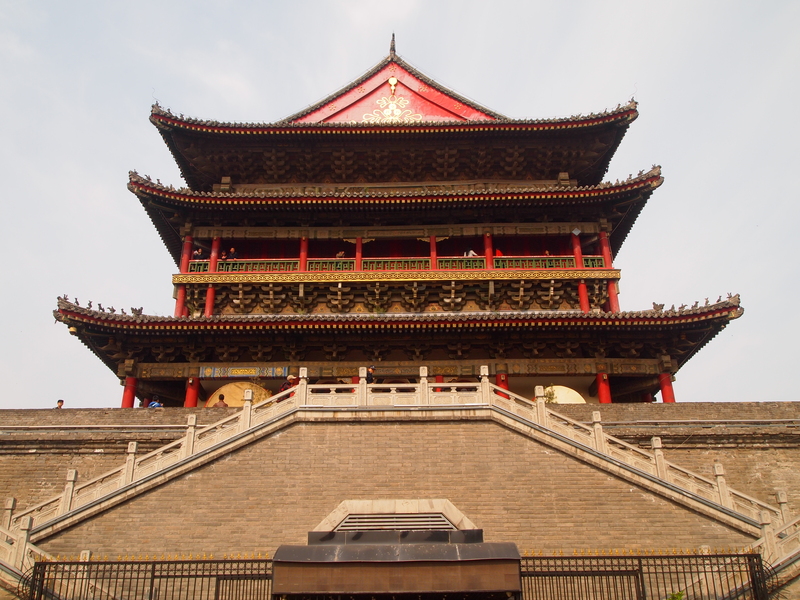 The Bell Tower was originally built two blocks west of here in 1384 during the early Ming dynasty. 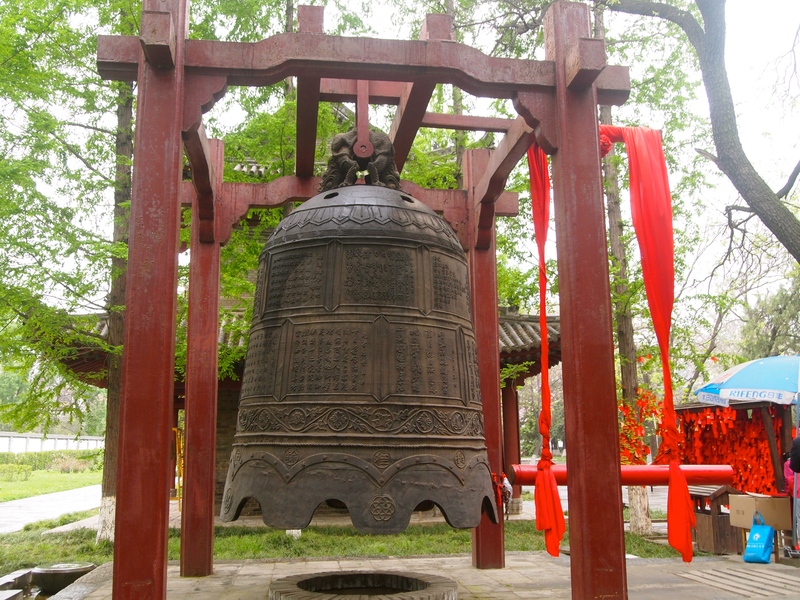 It contains several large bronze-cast bells from the Tang dynasty. 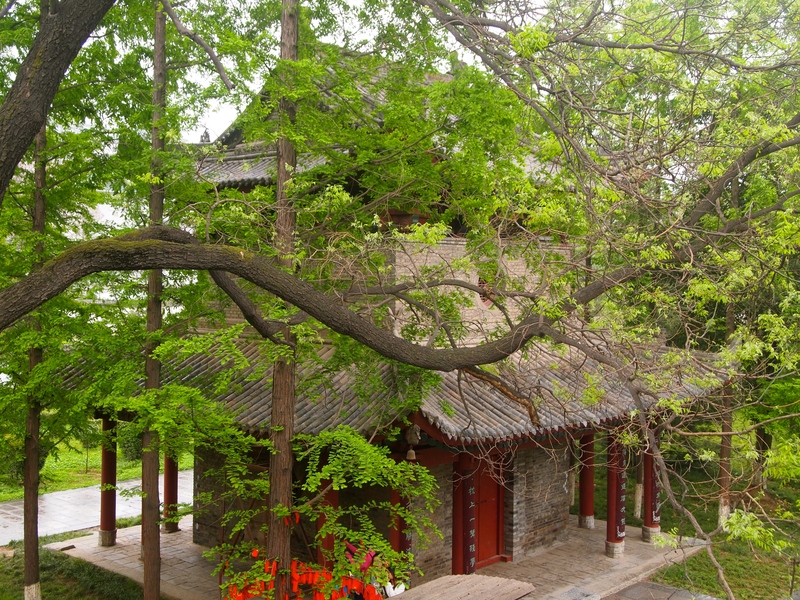 The present structure was built in 1582 and restored in 1739. 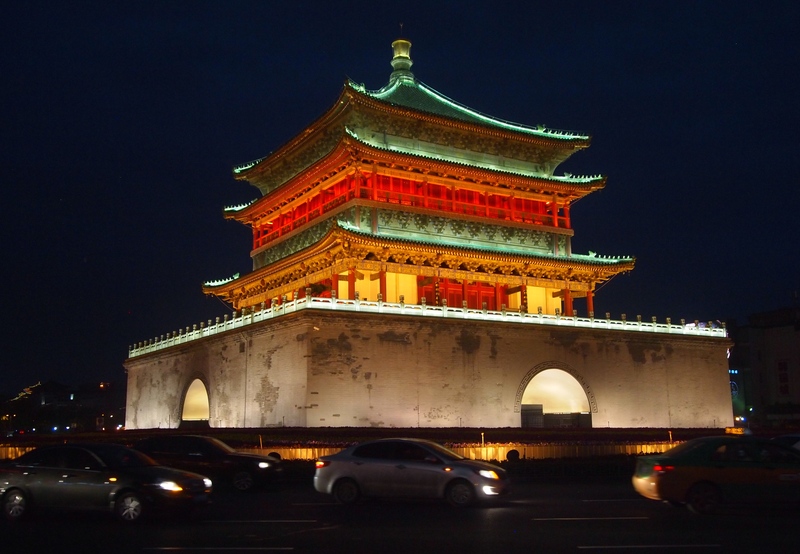 This colorful triple-eaved wooden structure built on a brick platform is lit up tastefully and provides a beacon for people trying to get their bearings in the city (Lonely Planet China & Wikipedia: Bell Tower of Xi’an). 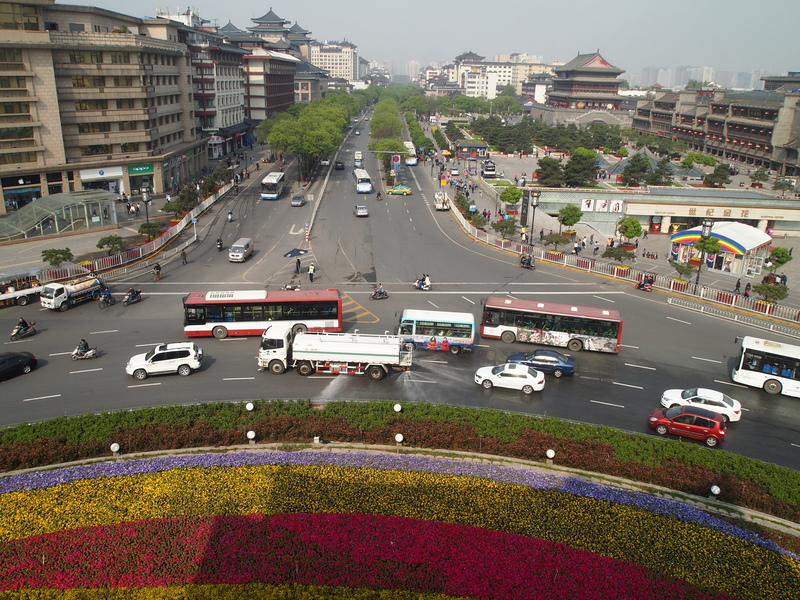 It’s quite a busy spot as it’s in the center of a roundabout that is at the crossroads of the four major streets in Xi’an. 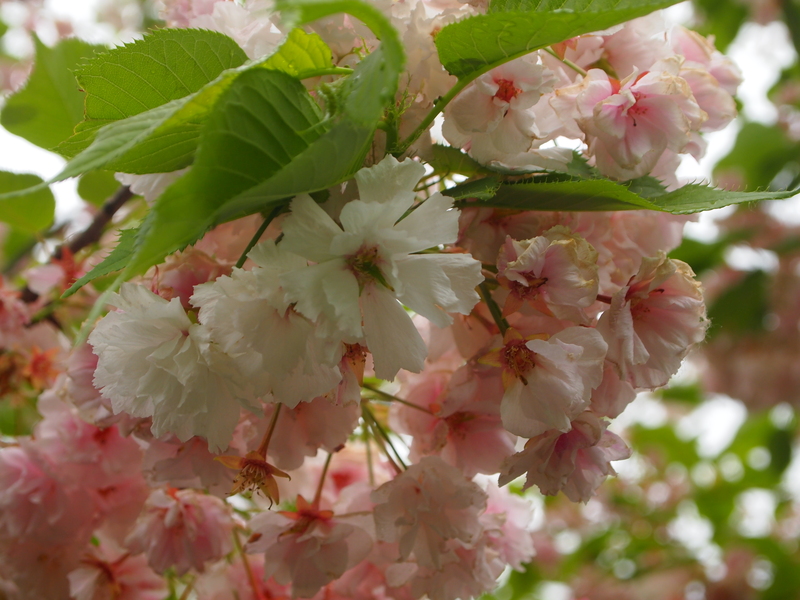 You can get to it by way of a tunnel which also leads to the subway. 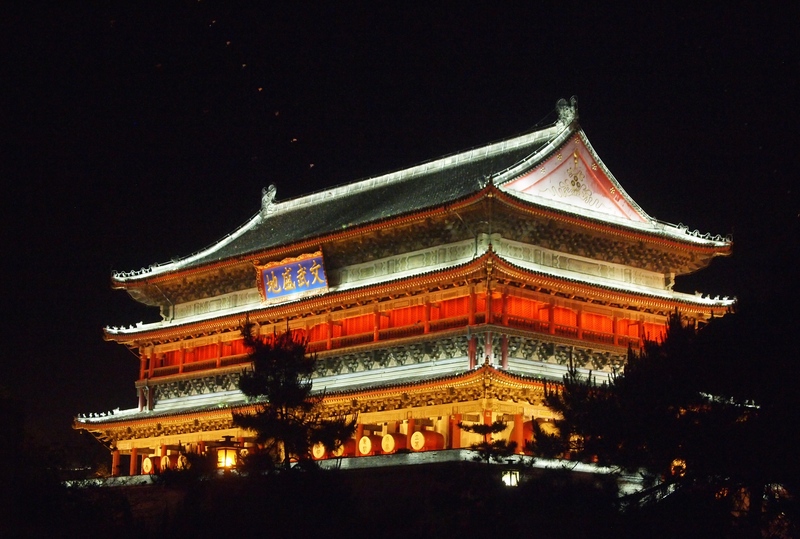 Just west of the Bell Tower is the Drum Tower. I will visit both of these the day after tomorrow. 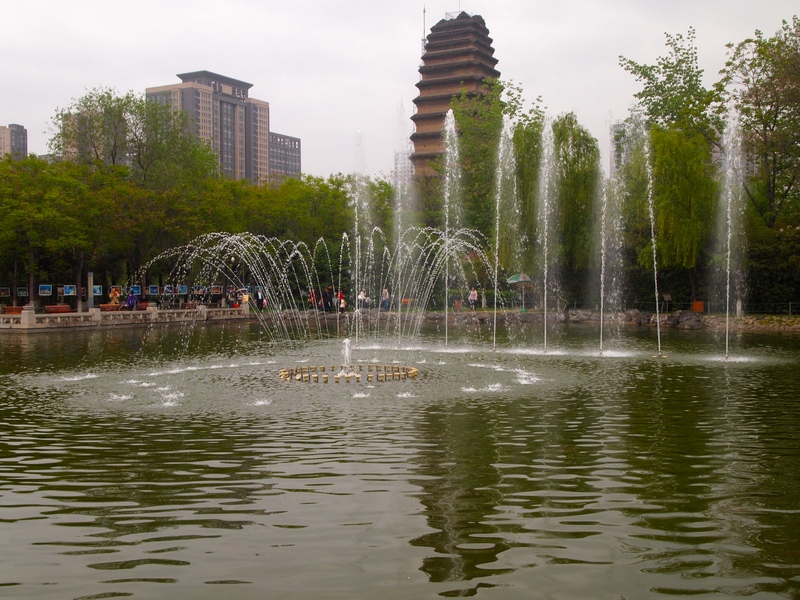 Saturday, April 18: After leaving the Beilin Museum, I take a rickety three-wheeled taxi to the Small Wild Goose Pagoda outside of the Xi’an City Walls. 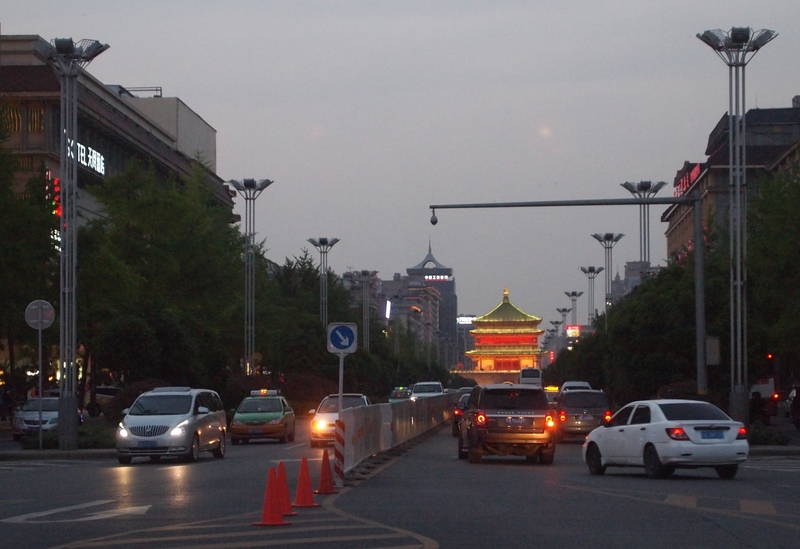 It’s quite a long and bumpy ride, and my head is rattling when I step out of the taxi and walk through the pagoda entrance. 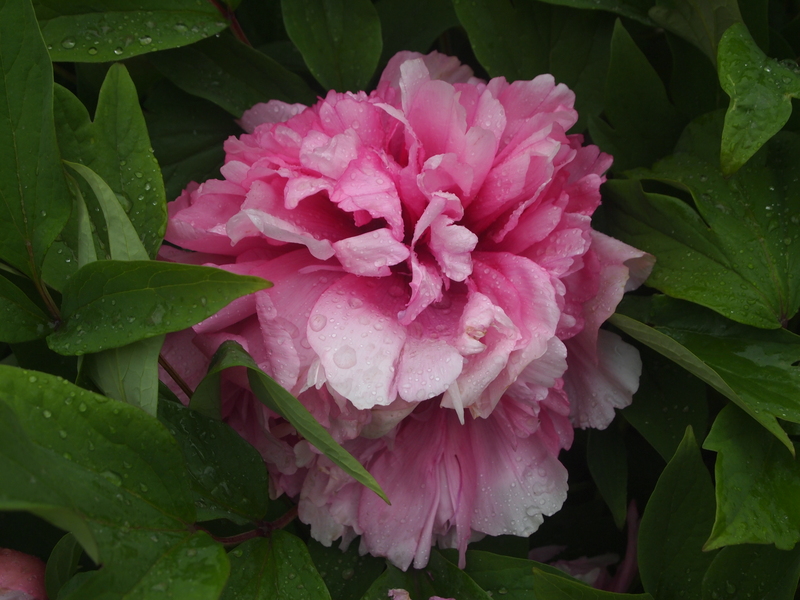 It’s still a dark and dreary day, but at least it’s stopped raining. 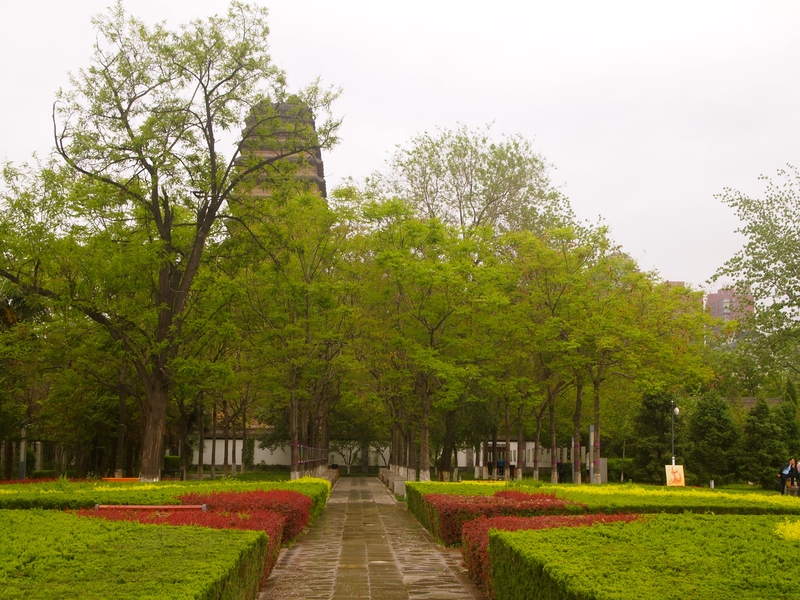 I walk around the pagoda, admiring the views from different vantage points and angles. 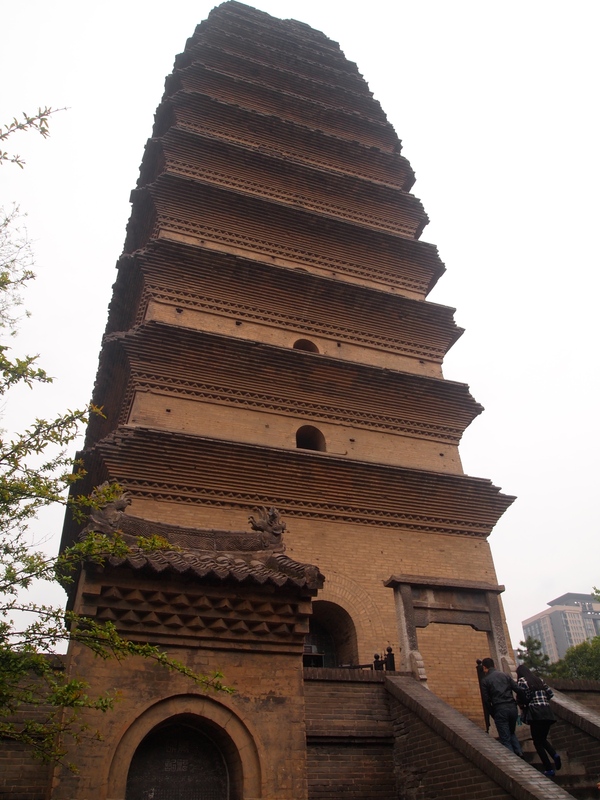 The Xiaoyan Ta, or Small Wild Goose Pagoda, is a delicate 45-meter tall building constructed in 707, during the Tang Dynasty. 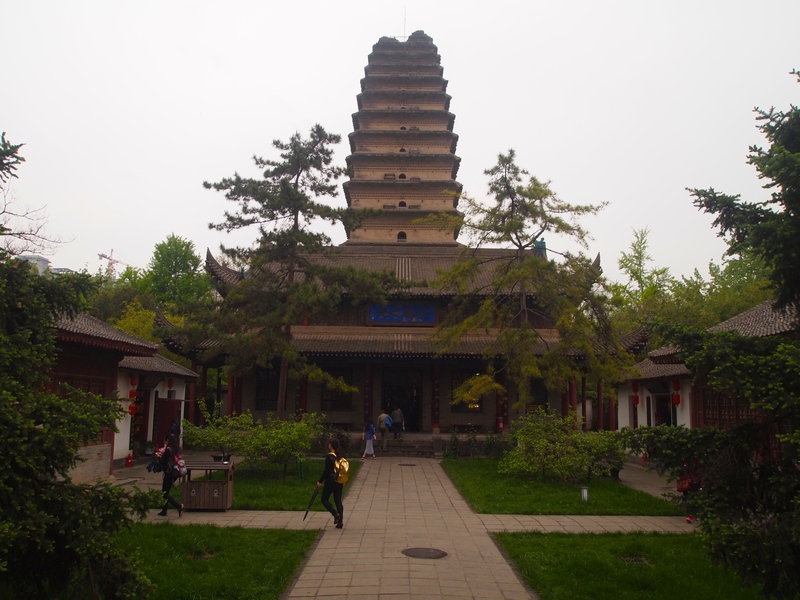 It’s a Buddhist pagoda of the Jianfu Temple, one of the three Buddhist Sutra Translation Venues of Chang’an City that have been well-known in the history of Buddhist sutra translation in China. 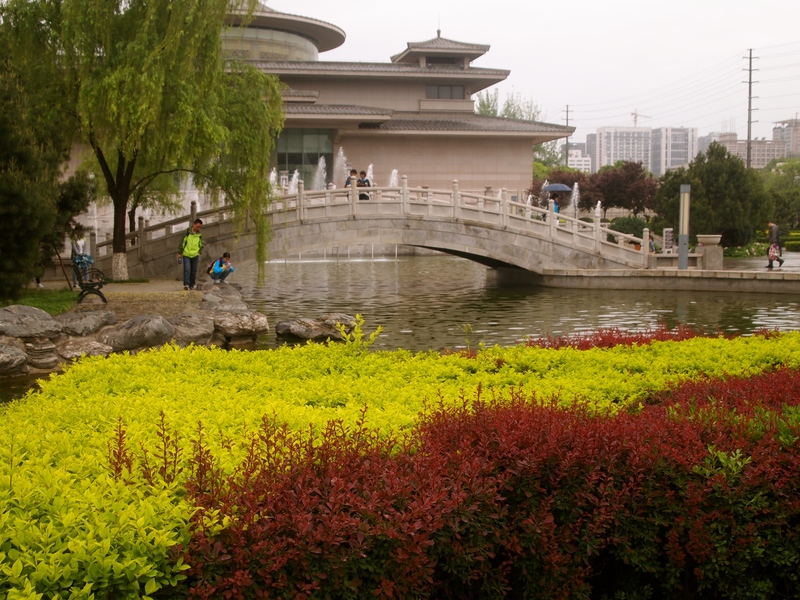 During the middle period of the Tang Dynasty, a cultural organization known as Buddhist Sutra Translation Institute was established here; it was directly managed by the imperial government. 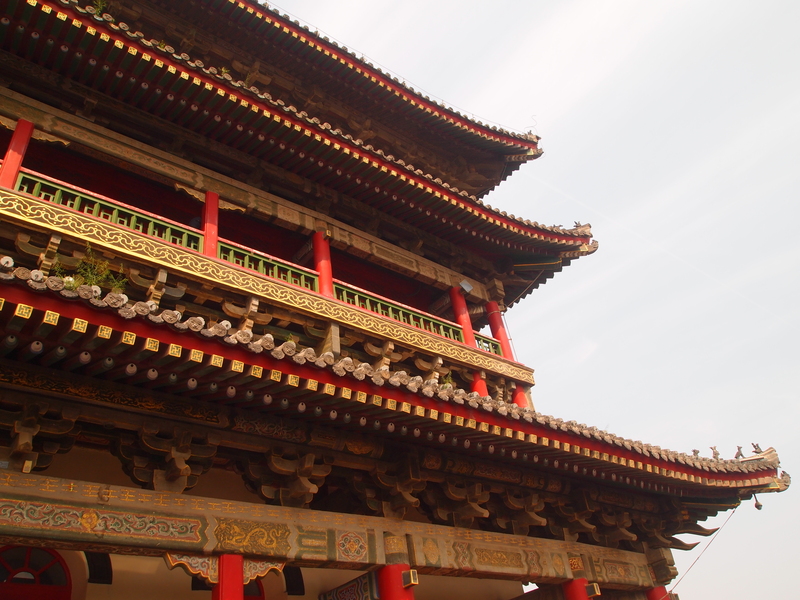 It attracted monks from different countries to translate Buddhist texts. 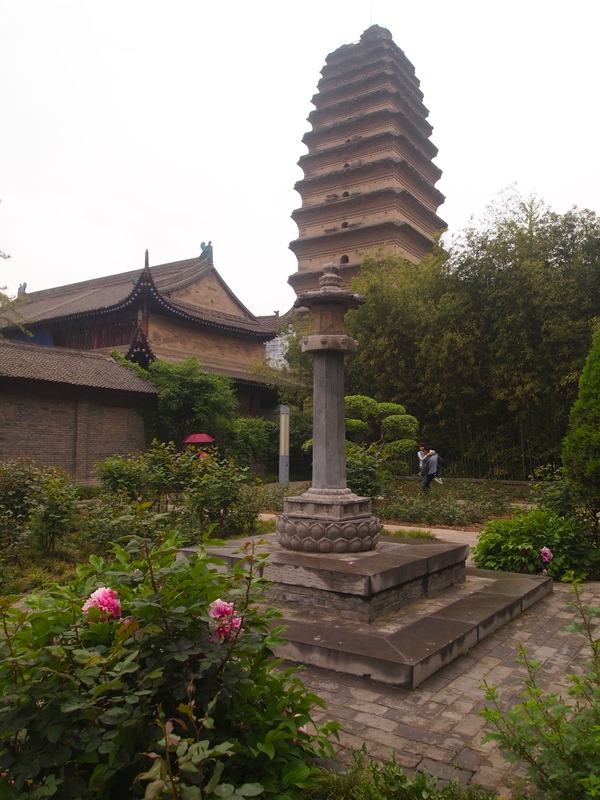 The Small Wild Goose Pagoda is an example of Buddhist architecture built during the heyday of the Silk Road as a witness to the history of Buddhism’s introduction to China by India. 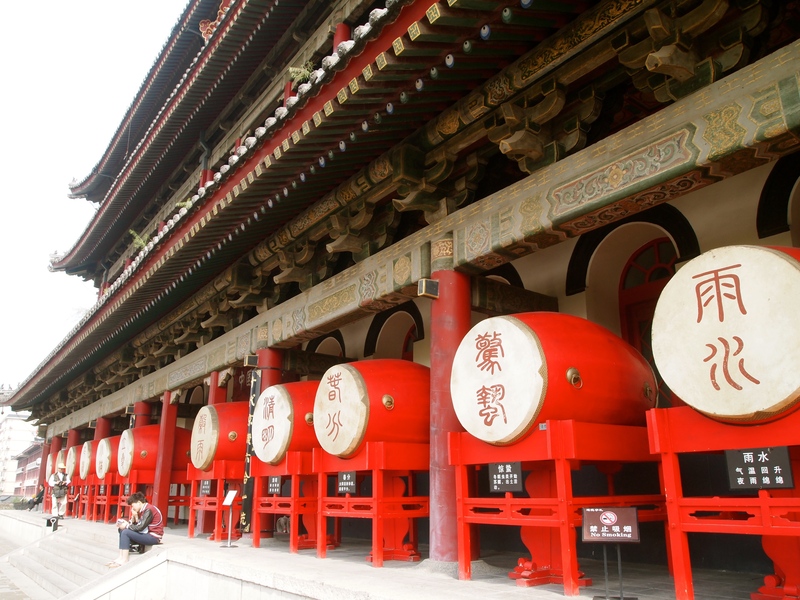 It was popular in Chang’an, the capital of the Tang Dynasty. 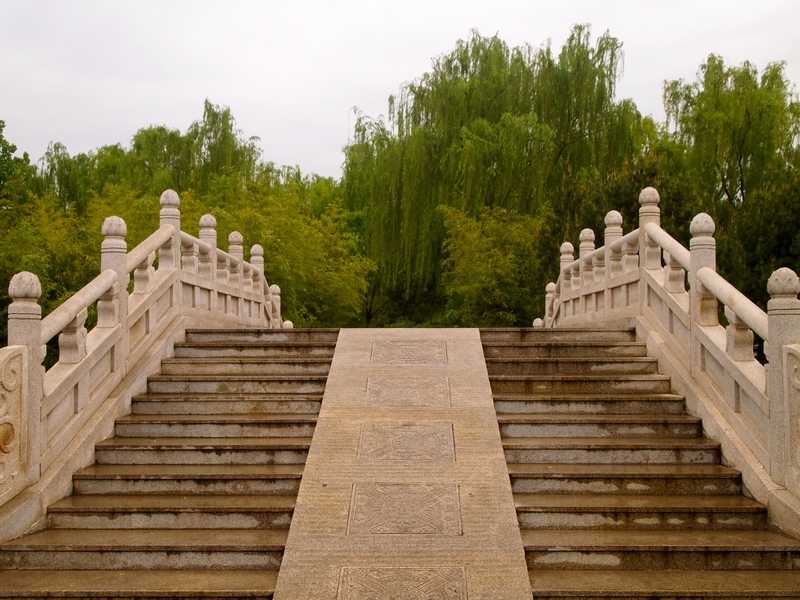 On one side of the pagoda are steps leading up, but first I have to buy a ticket to climb, which I do at the temple across the path. 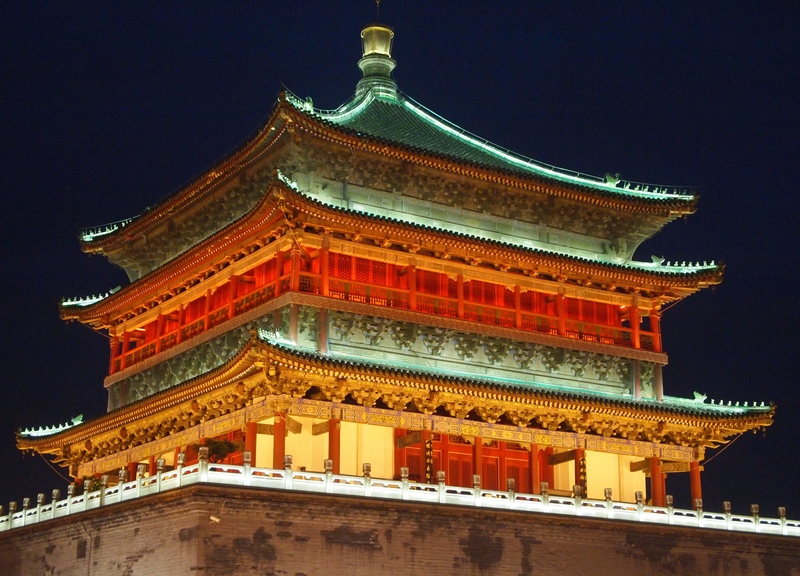 The pagoda was originally fifteen stories, but the top two were damaged in an earthquake. 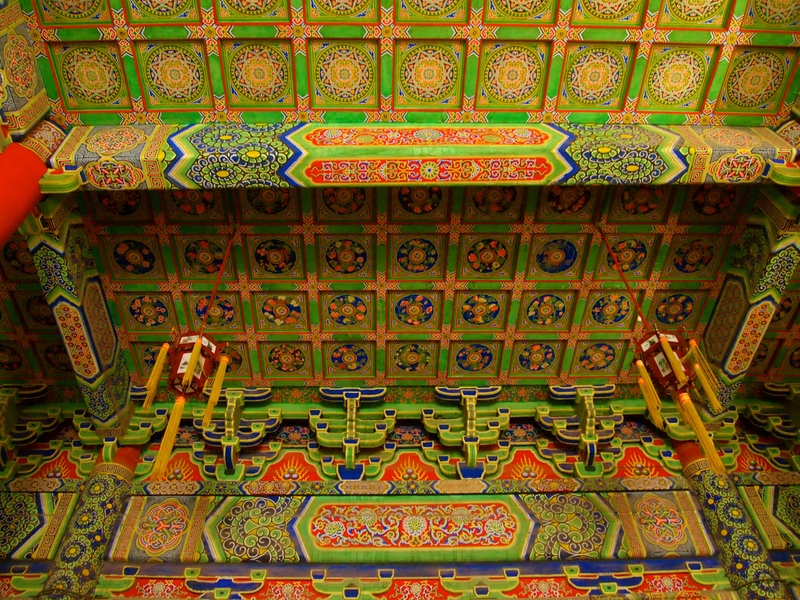 I climb up to the thirteenth story where I then climb a ladder through a hole to the jagged rooftop. Here I find some wonderful views. 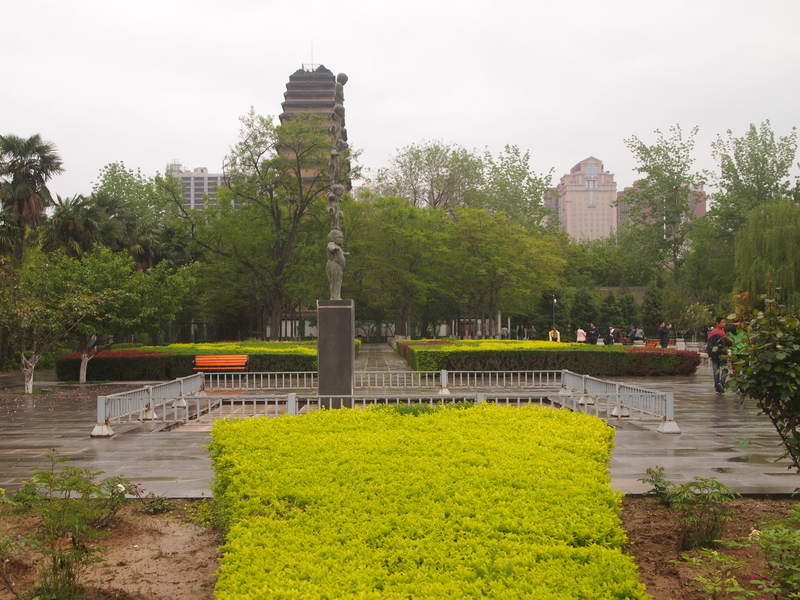 After exiting the pagoda, I take a stroll through the Jianfu Temple grounds. 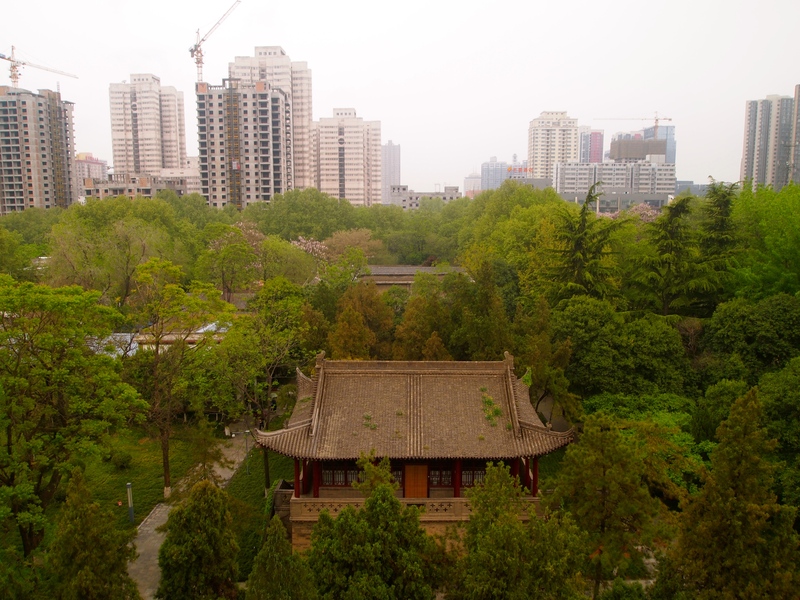 Jianfu Temple, or Felicity Temple, and the pagoda are rare cultural relics from the Tang Dynasty, regarded as the Golden Age in Chinese history with its capital Chang’an as the most majestic city in the world at that time, according to a placard at the temple. 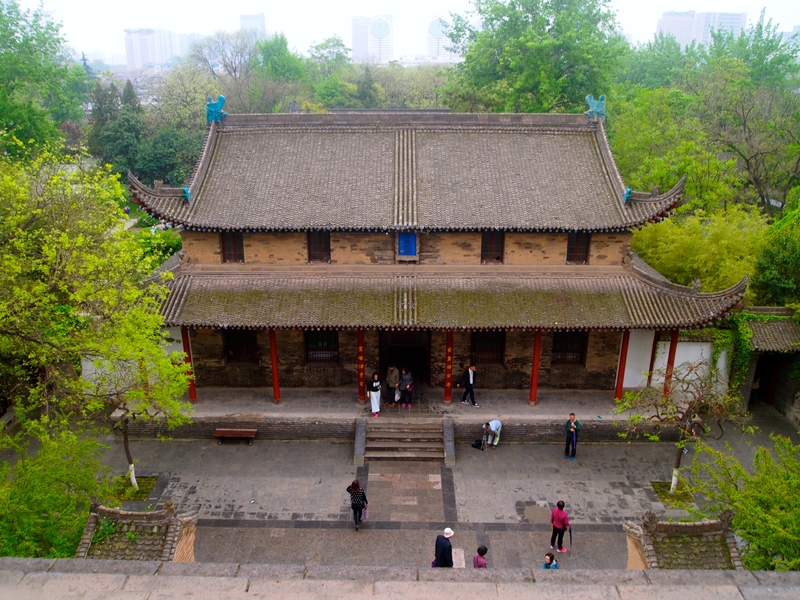 The temple complex was reconstructed in the Ming and Qing dynasty style and stands witness to the 1,000-year development of Xi’an City. 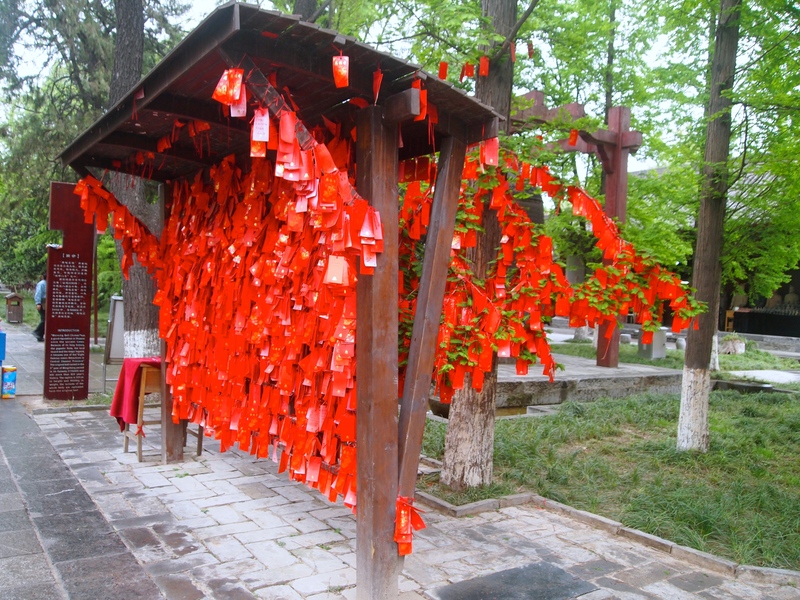 After leaving the pretty gardens of the temple, I walk around the rest of the complex, where I find a number of pavilions, a structure covered in red wishes, a bell and a Bell Tower. 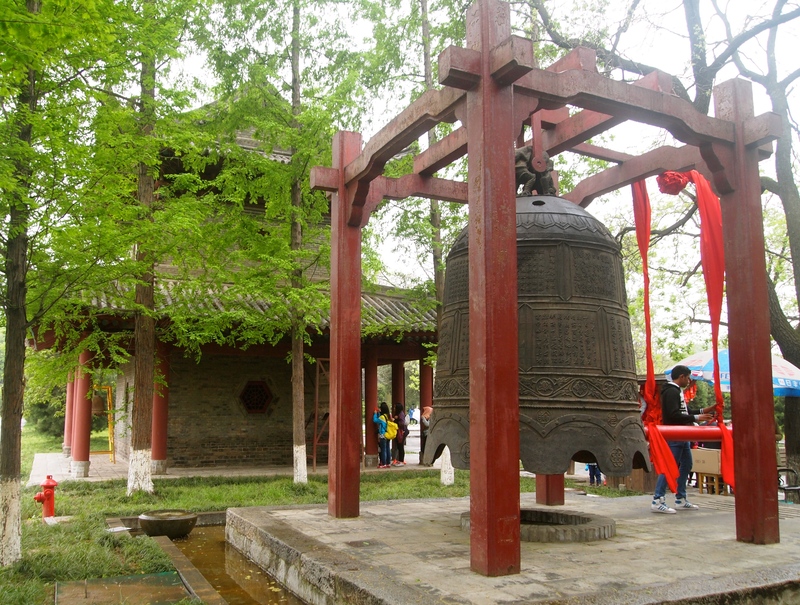 Built in the Qing dynasty, the Bell Tower has a brick and wood structure, a multi-eaved hip-and-gable roof, and a giant iron bell that has been used for telling time and in Buddhist services. 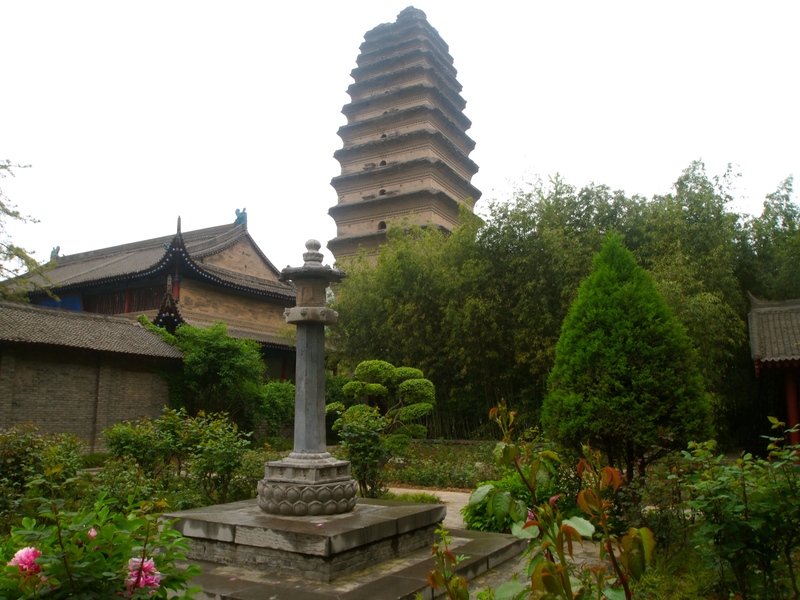 During the Ming and Qing dynasties, the “bell chiming in the morning at the Small Wild Goose Pagoda” was one of the eight scenic attractions in the Guanzhong area. 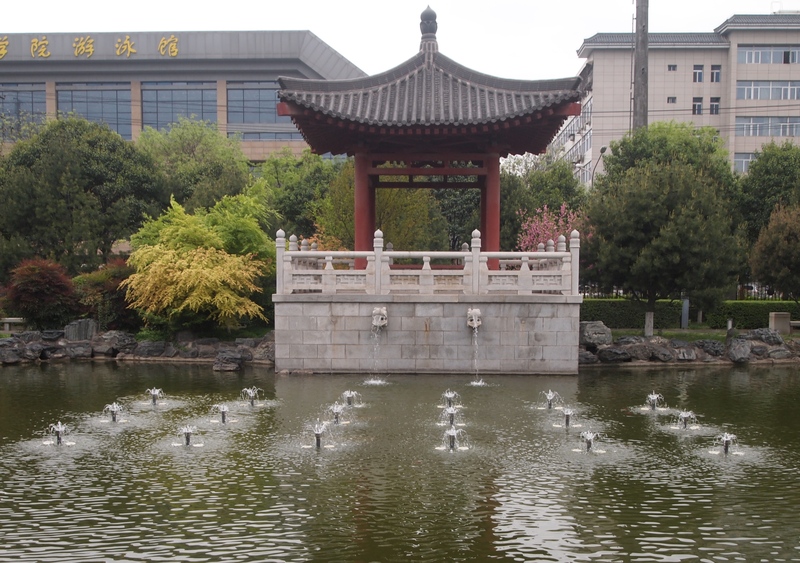 I go out through the gate of a large wall, where I find interesting stone characters, cherry blossom trees, fountains, ponds, bridges, gardens and more views of the Small Wild Goose Pagoda. 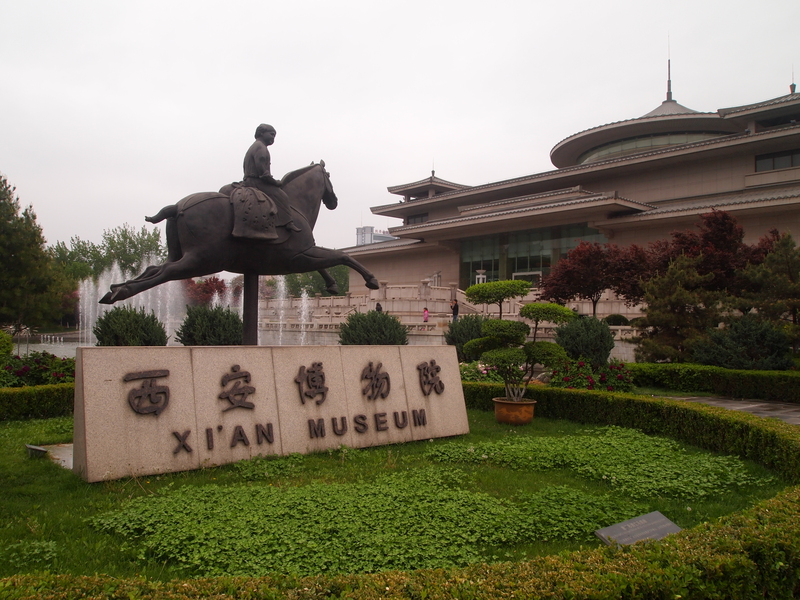 Strolling these grounds, I run across the Xi’an Museum, but I have no intention of going here since it has stopped raining. 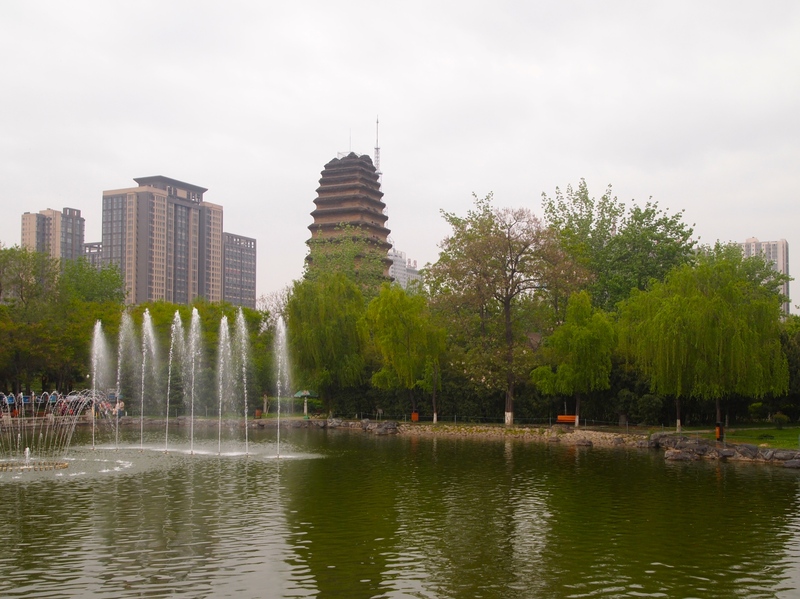 I exit the pagoda grounds near the museum and head in a southerly direction. 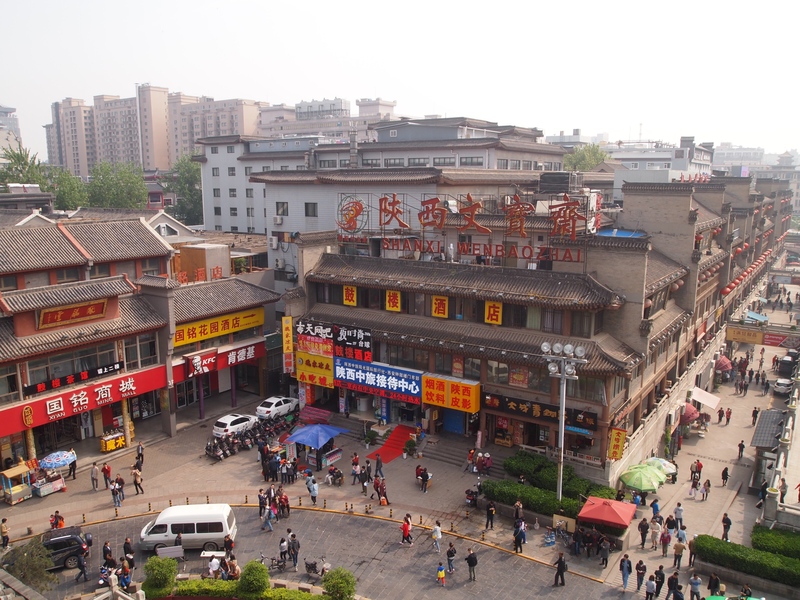 The map I have shows that if I walk several blocks south along Zhuque Dajie and cross a road called Nanerhuan Lu, I will find Daxingshan Si, another Buddhist temple, off a narrow market street. Little do I know just how long this walk will be. Funny how things look so much smaller on maps!